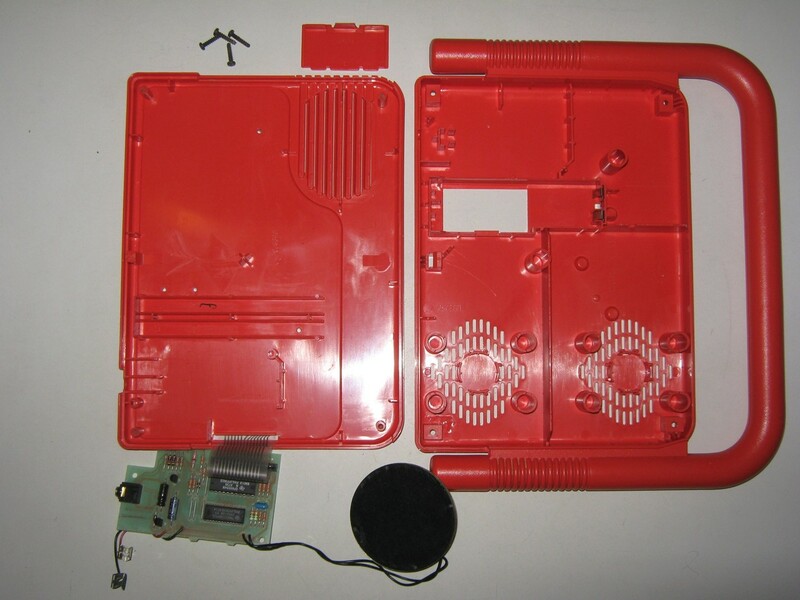 This is what remained after the recovery. 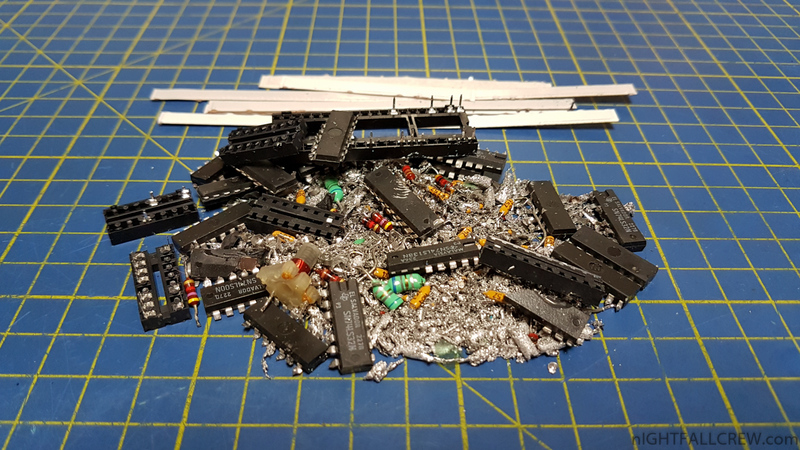 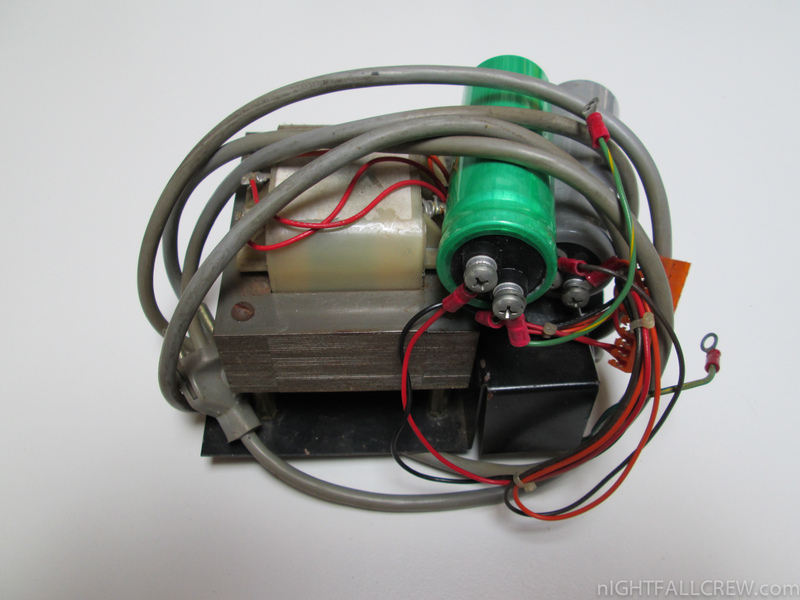 Some components (all TTL) are not been recovered, others were are already recovered some times ago for spare parts. 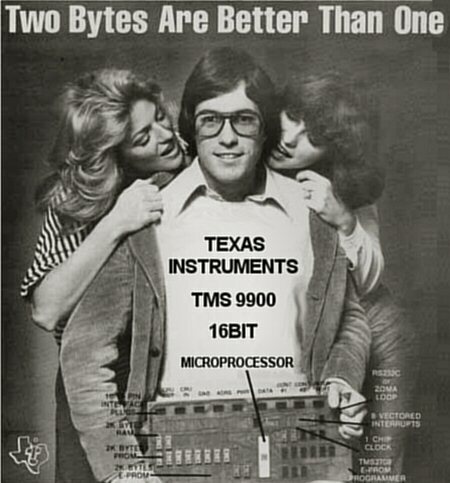 I thank my dear friend Ciro (www.ti99iuc.it) for giving me the “Peripheral Expansion System” and for making me discover a whole new world of the Home Computer Texas Instruments TI-99/4A. 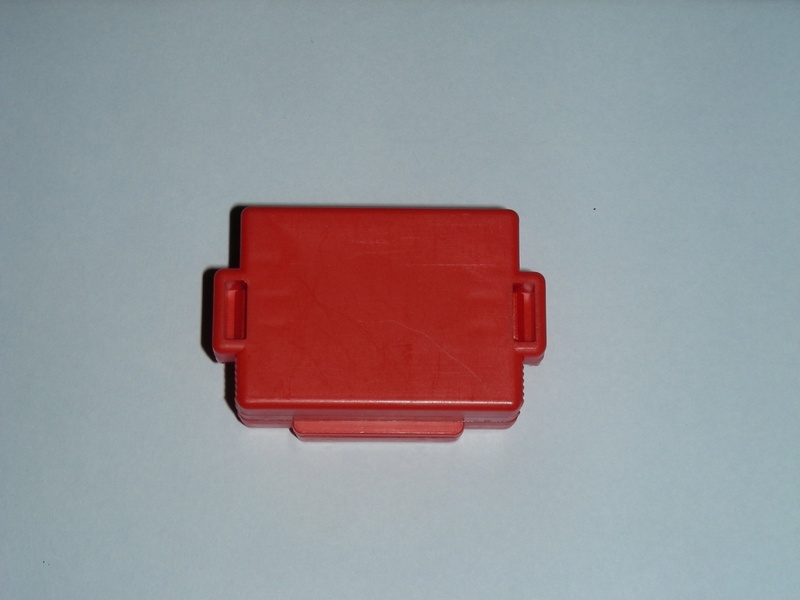 The Peripheral Expansion Box (aka P-Box or PEB) is a stable, silver/gray plastic and die-cast metal box containing eight slots for peripheral expansion cards and a compartment for a floppy drive or two drives of half height (“slim-line”, slim as understood in the 70ies and 80ies; today it is the normal height of 5,25″ drives for PCs). 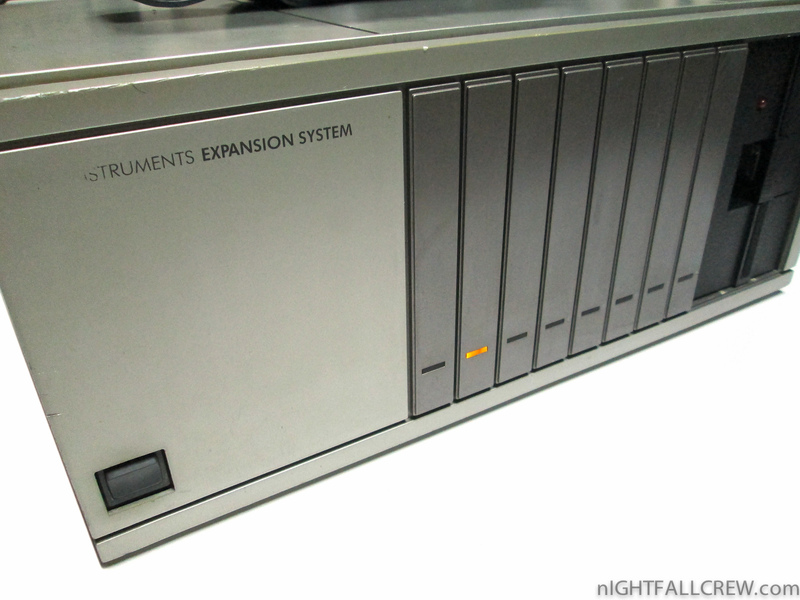 The PEB offers space for 8 expansion cards. 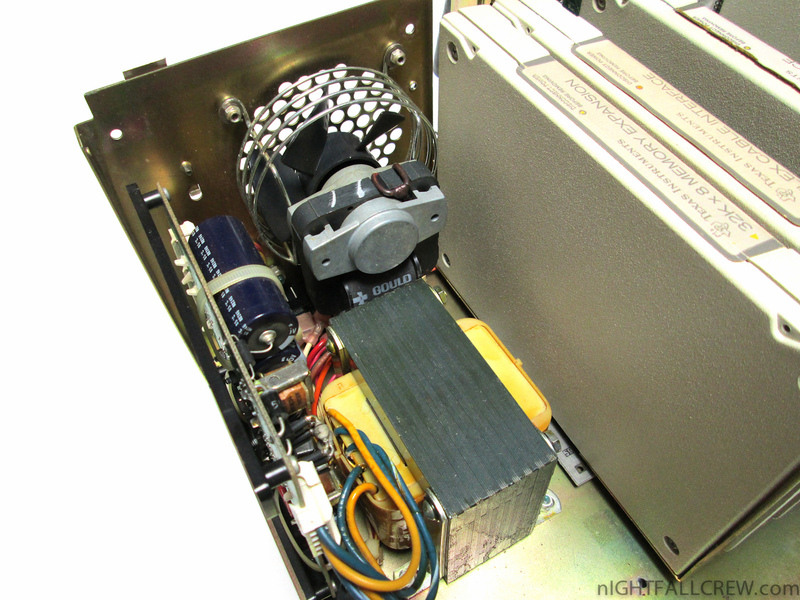 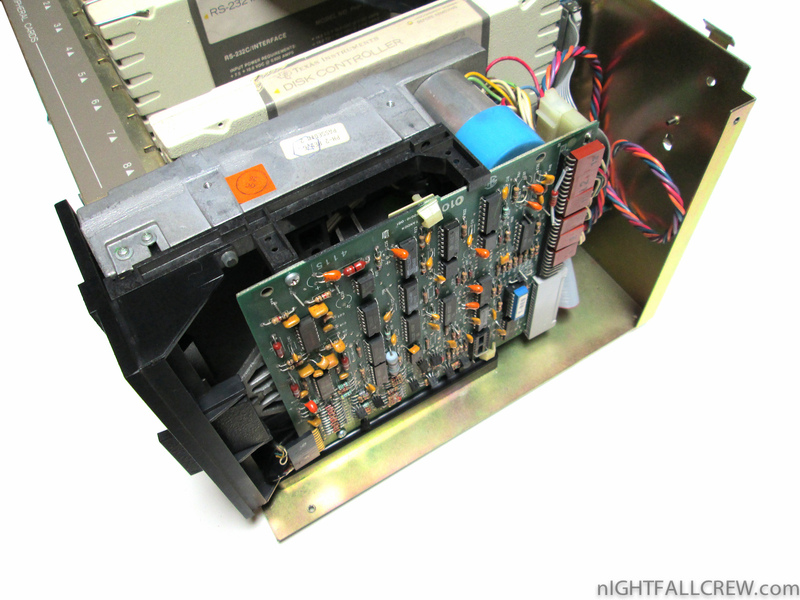 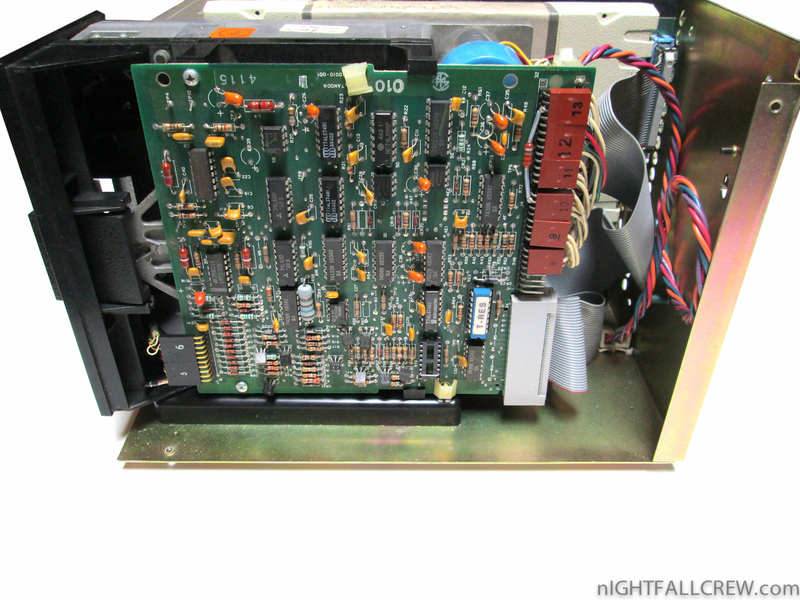 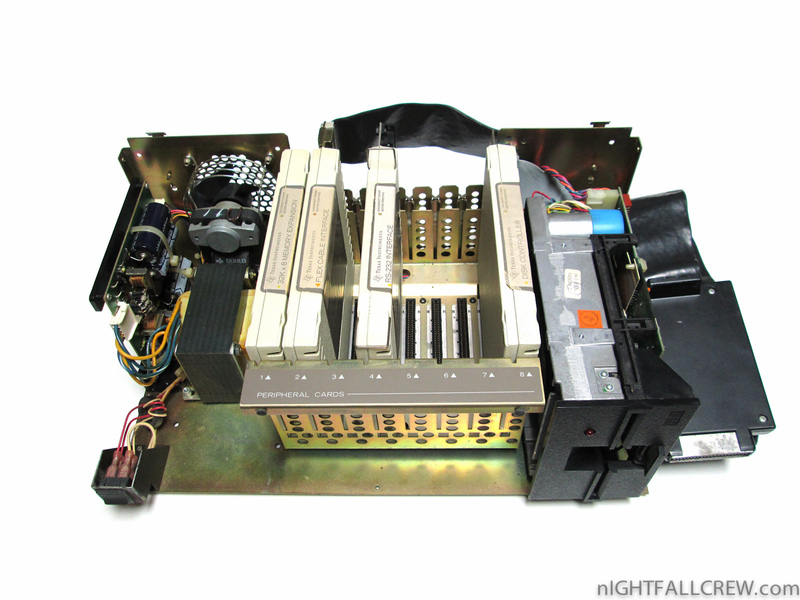 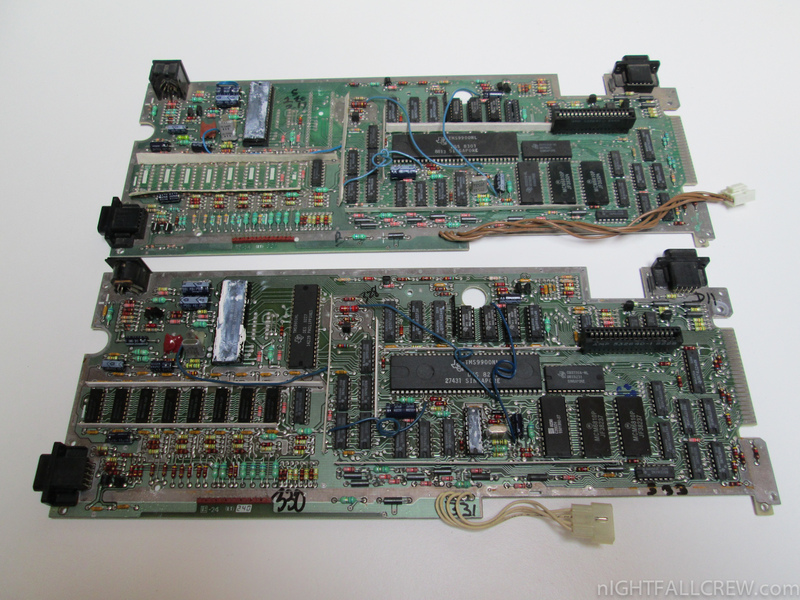 All slots are wired in parallel, and the power supply is designed to supply all cards including up to two floppy drives. 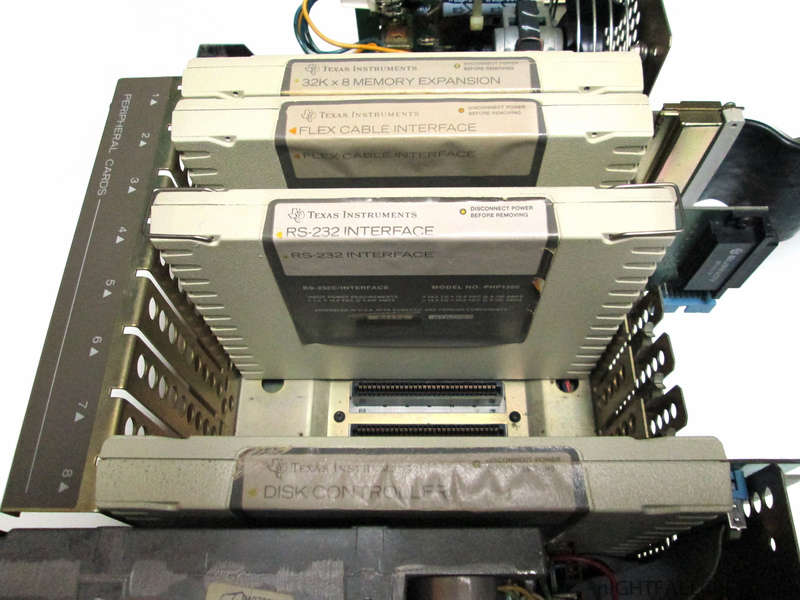 Floppy drives may be put into the right compartment of the box. 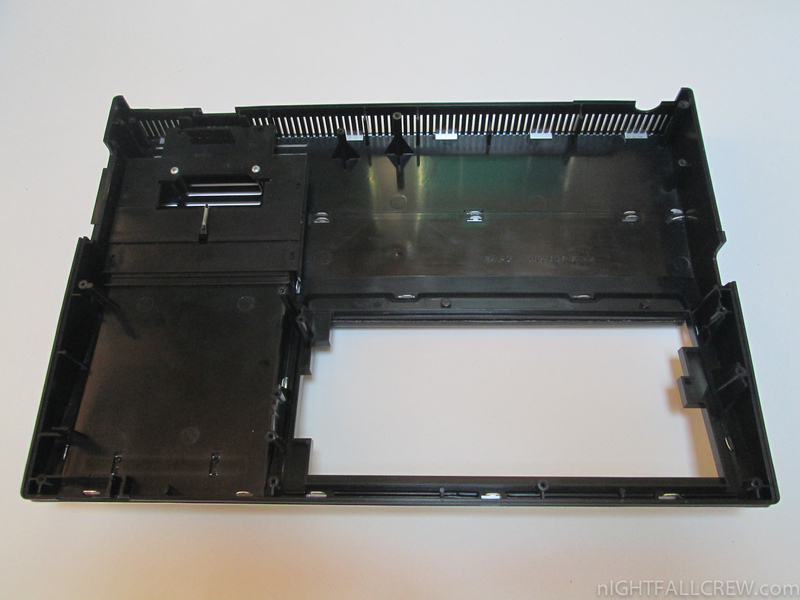 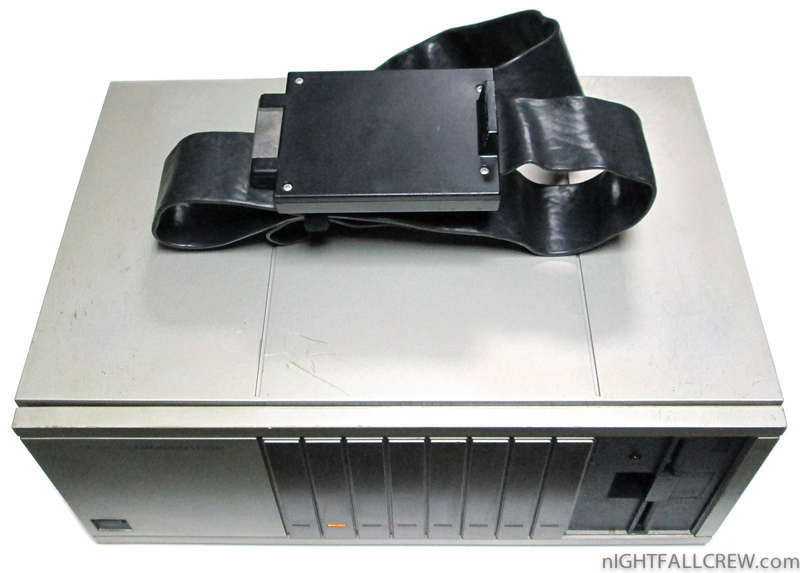 With the appearance of hard disk controller cards, users tried to mount hard drives into the box into the floppy compartment. 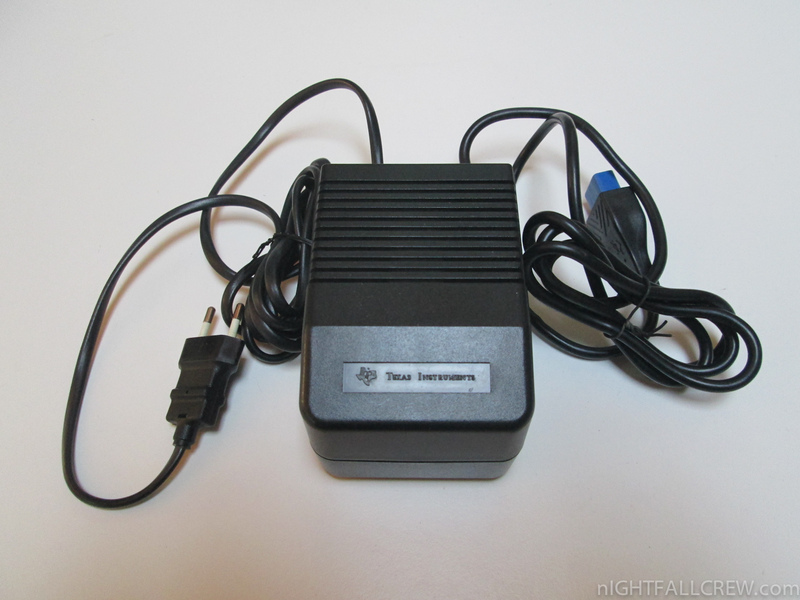 However, the power supply is not designed to sustain the current required for the hard drives; thus, a separate power supply is recommended. 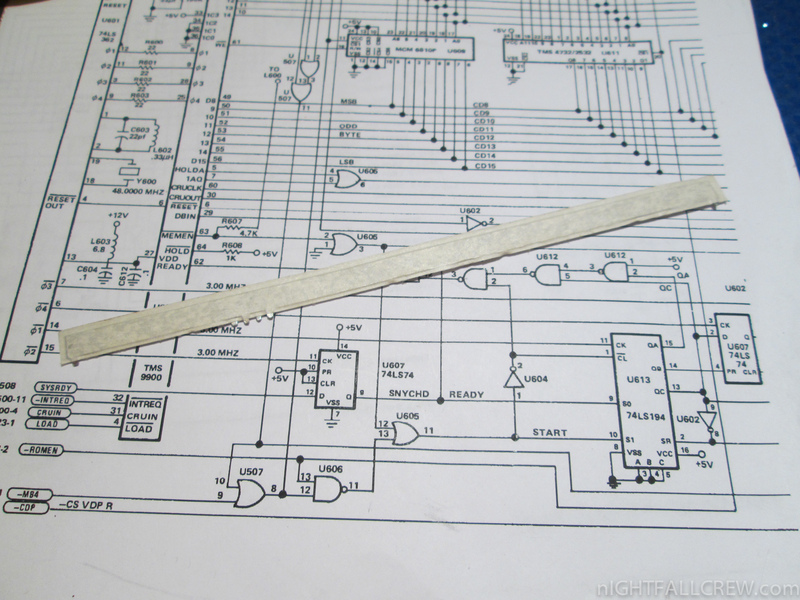 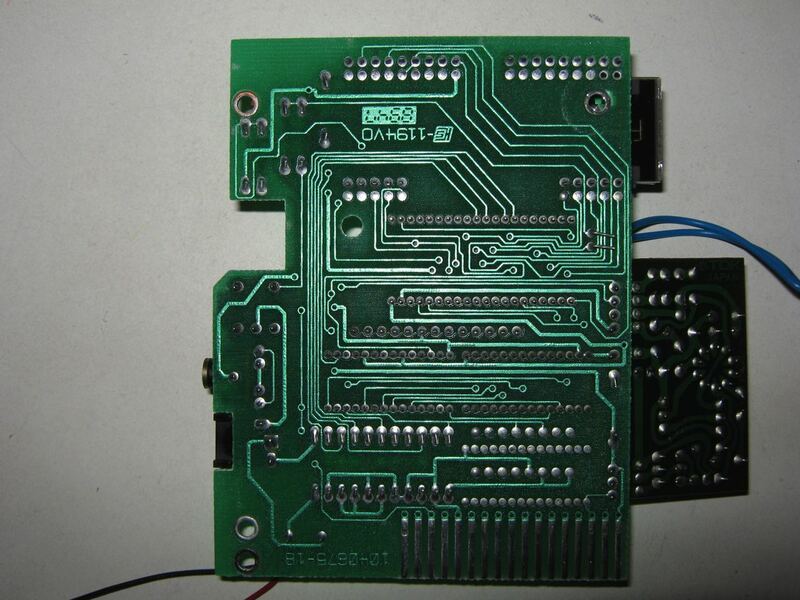 All peripheral cards are expected to provide their own voltage regulators. 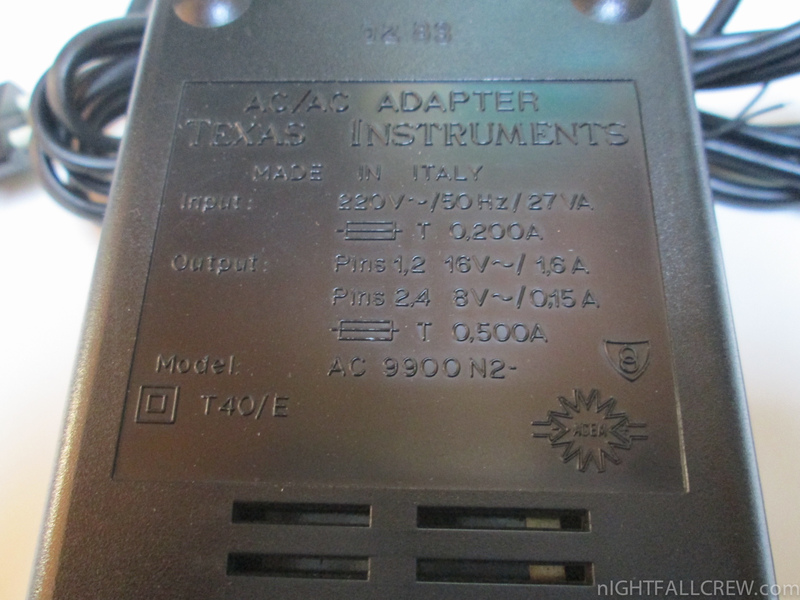 Therefore, it is not recommended to replace the power supply by today’s PC switched power supplies, as those already provide regulated power which may cause the regulators on the cards to lower the voltage below the acceptable range. 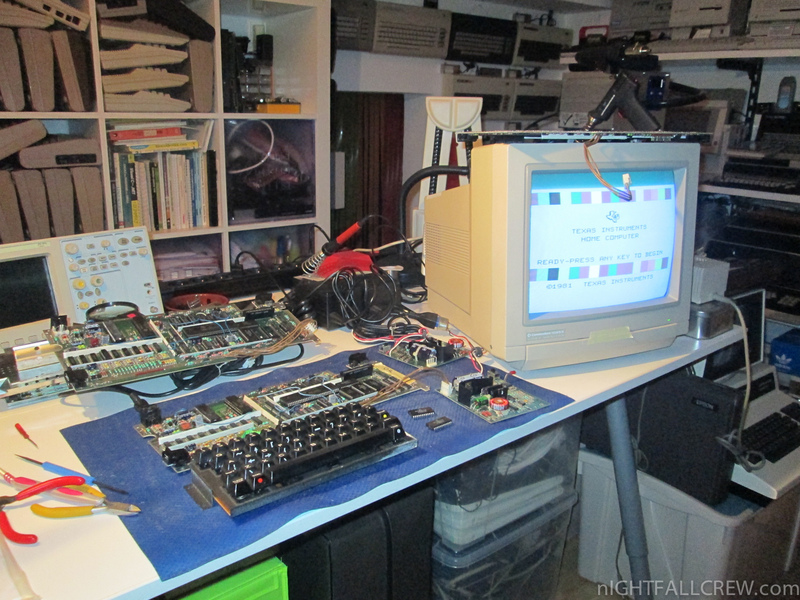 Working but with some dirt on the screen. 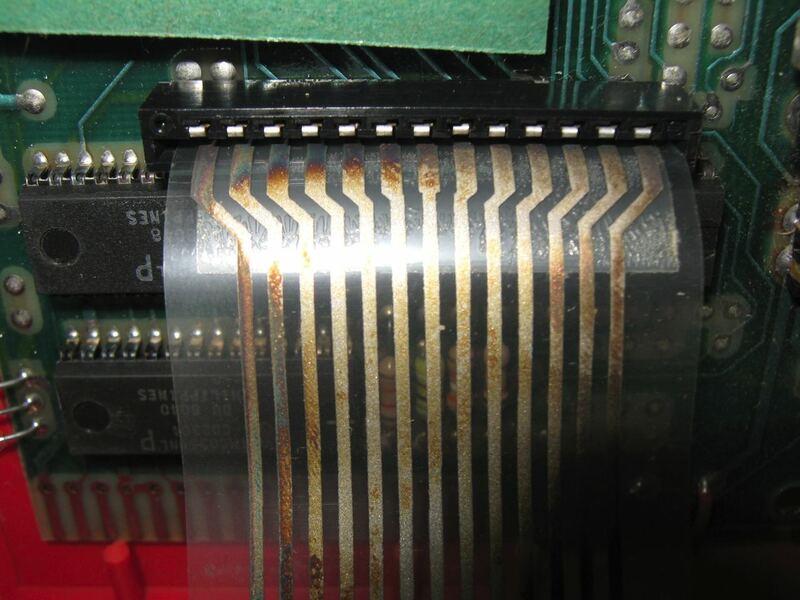 Vertical Stripes moving with a deafening sound. 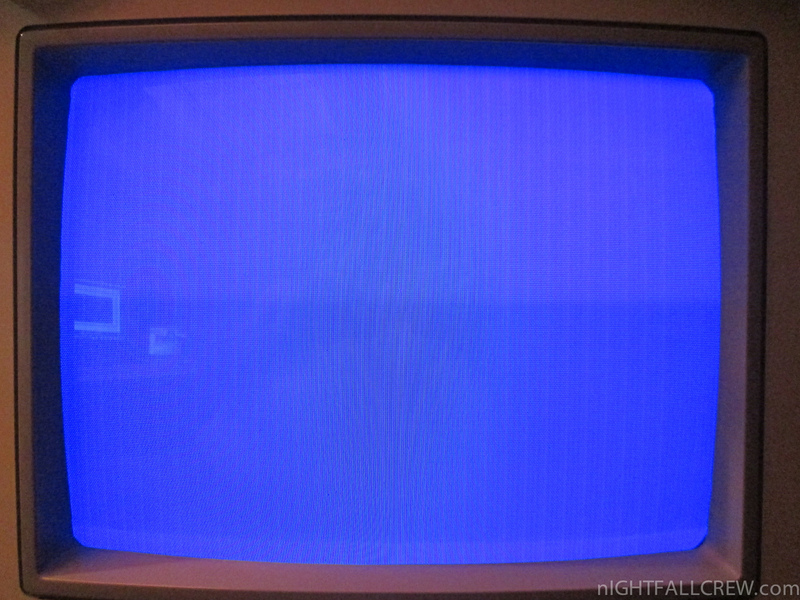 Blue Screen with thin vertical stripes and deafening sound. 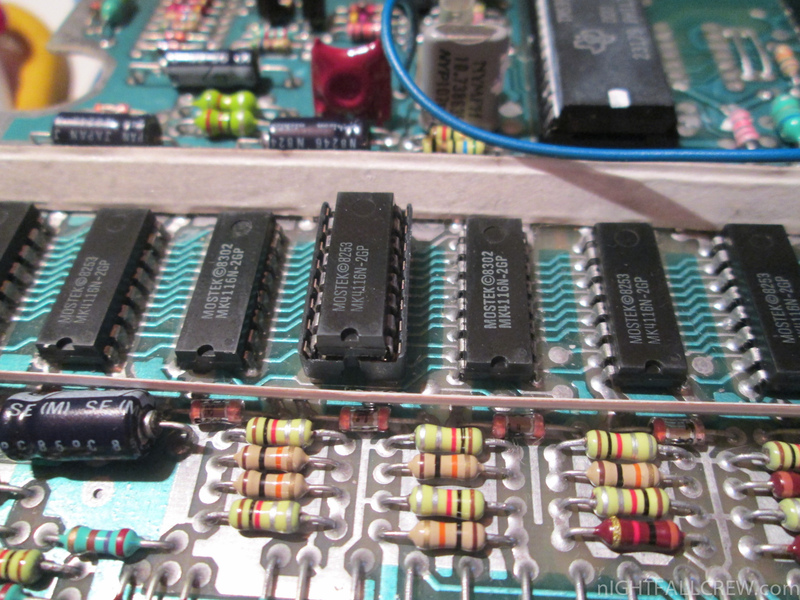 Dirt on the screen: replaced a 4116 RAM. 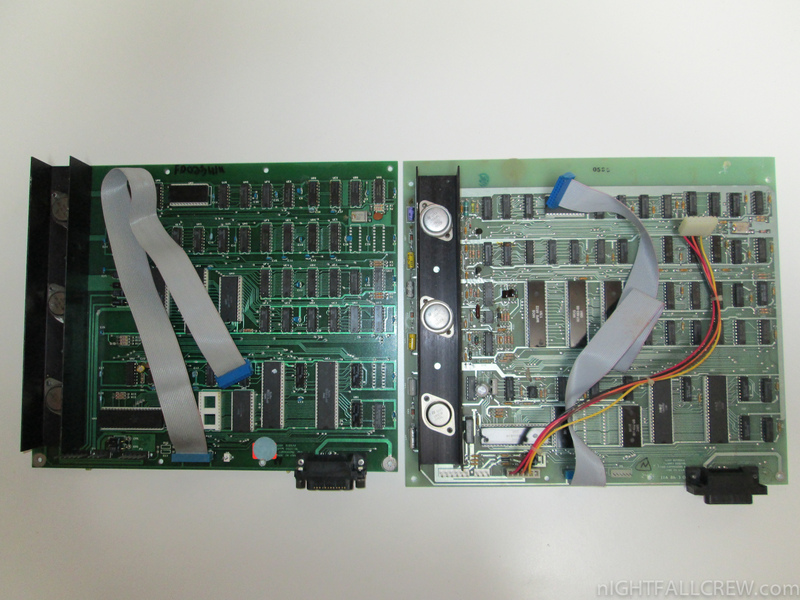 The third motherboard was used for spare parts. 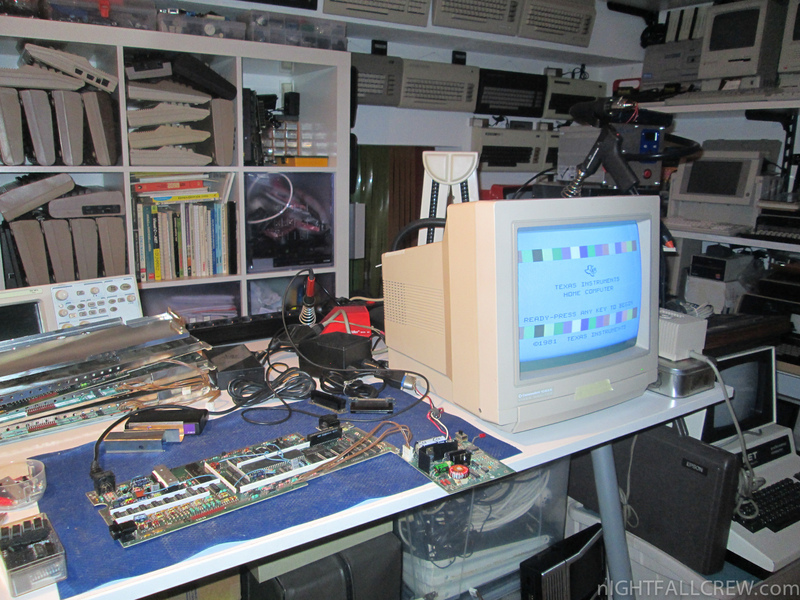 The fourth and fifth motherboard with the blue screen have been the most annoying. 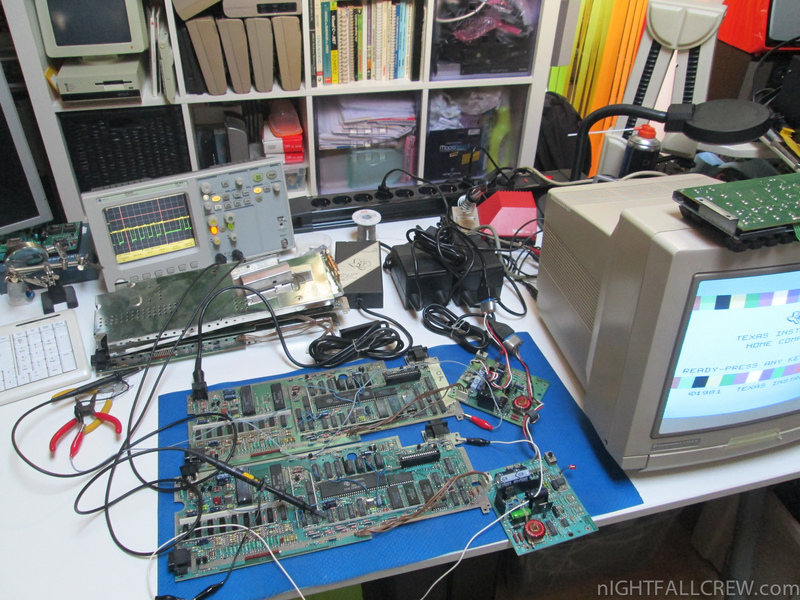 I spent 6 + hours to make measurements with an oscilloscope comparing one of the two motherboards with a working one to find the fault but the signals/voltages were absolutely identical. 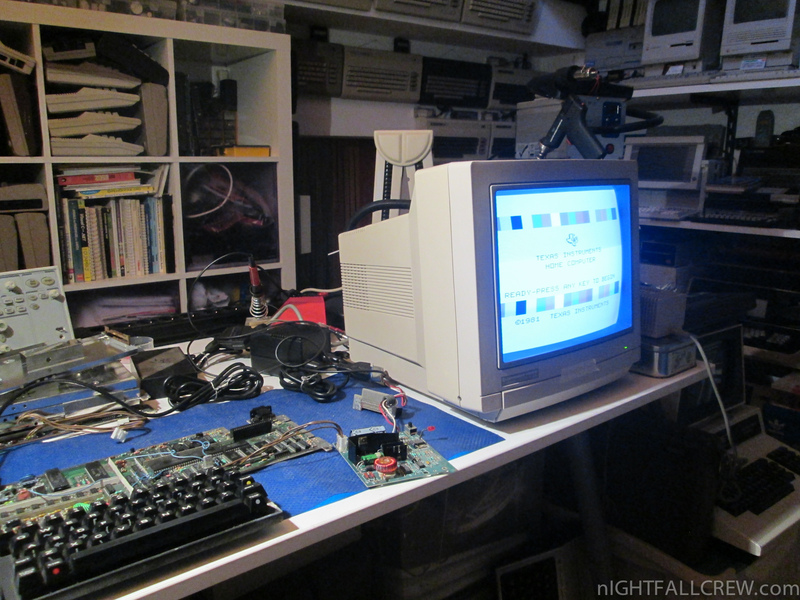 After all this work nothing had changed, nothing worked, always BLUE screen. 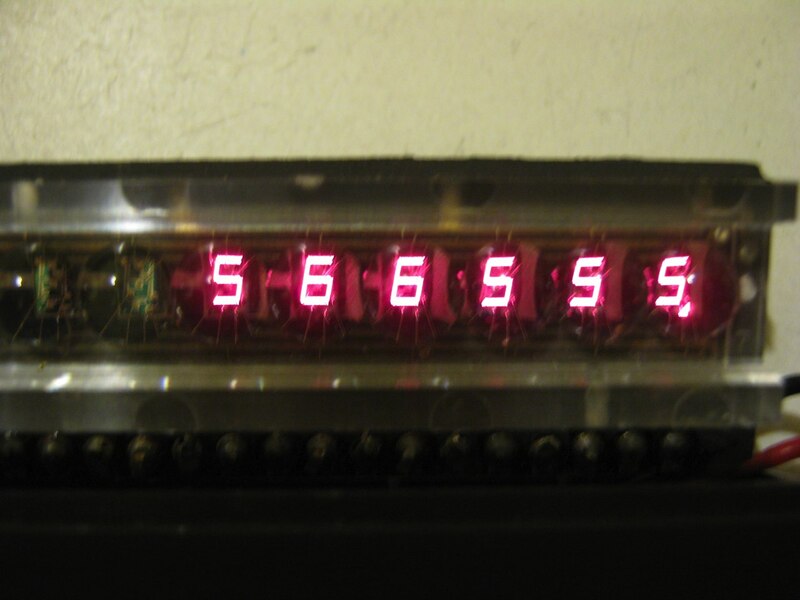 I redid the measurements, but nothing, everything looked the same. 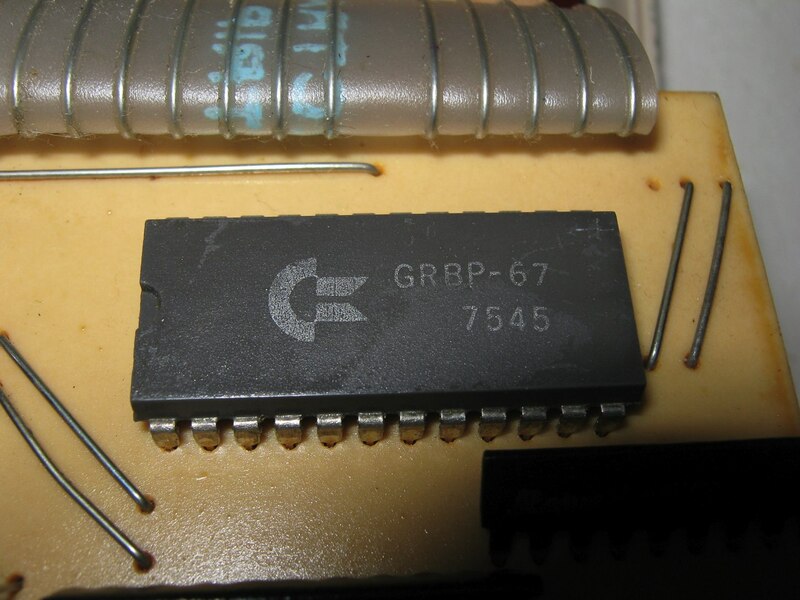 At this point there are only two static memories MCM6810P but that i don’t have investigated for what are used, because already on the motherboard are 8 x 4116 RAM Memory shared between Memory program and Video memory. 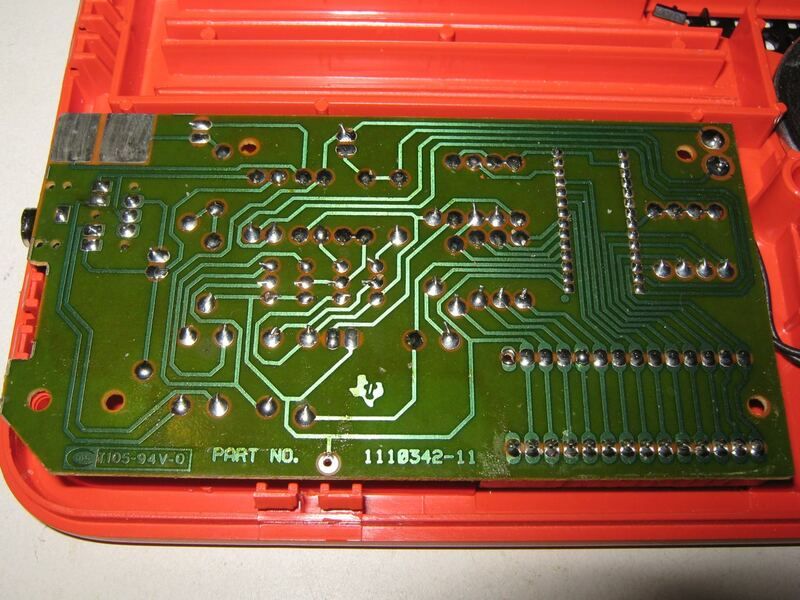 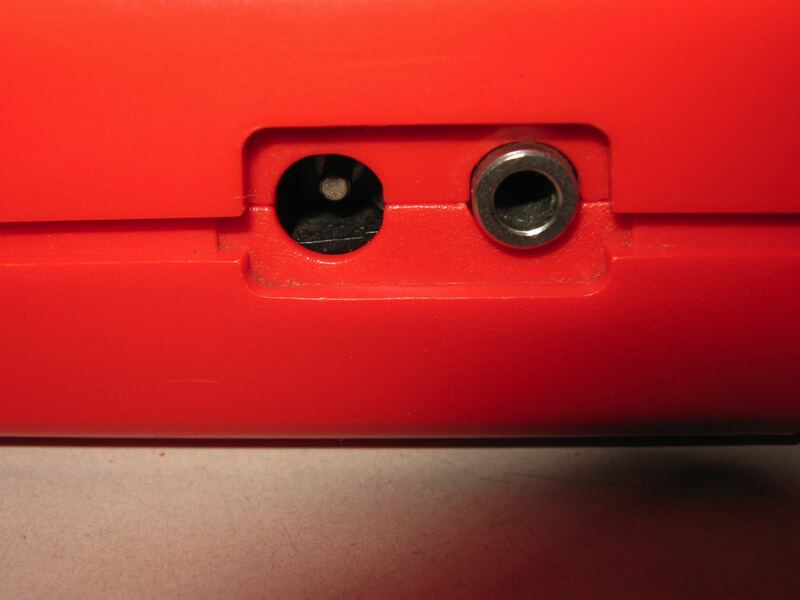 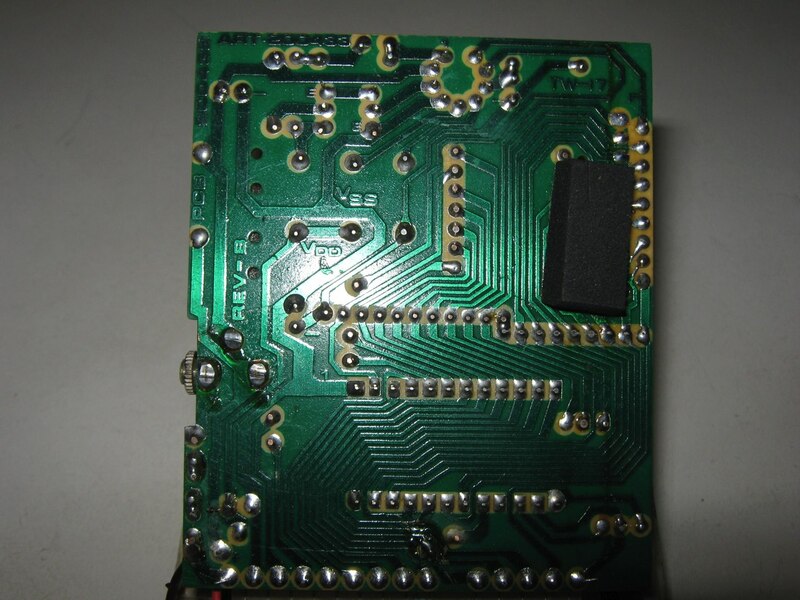 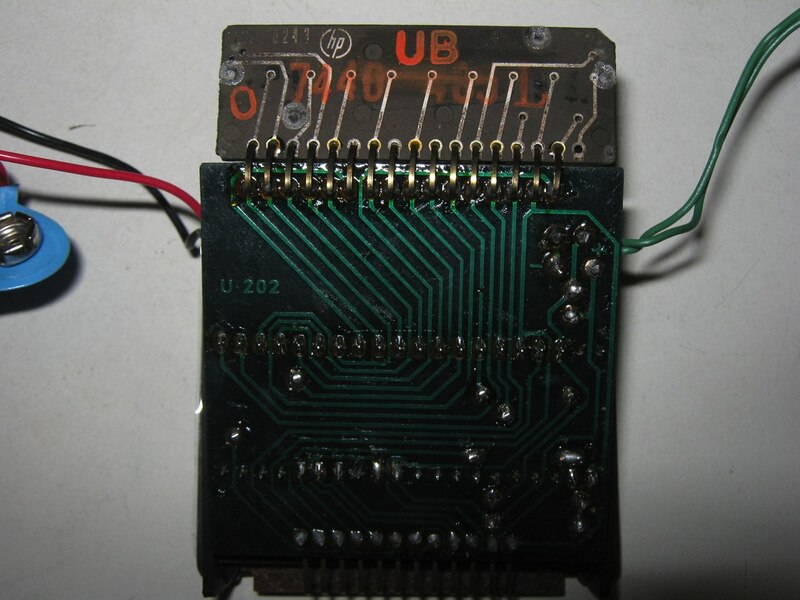 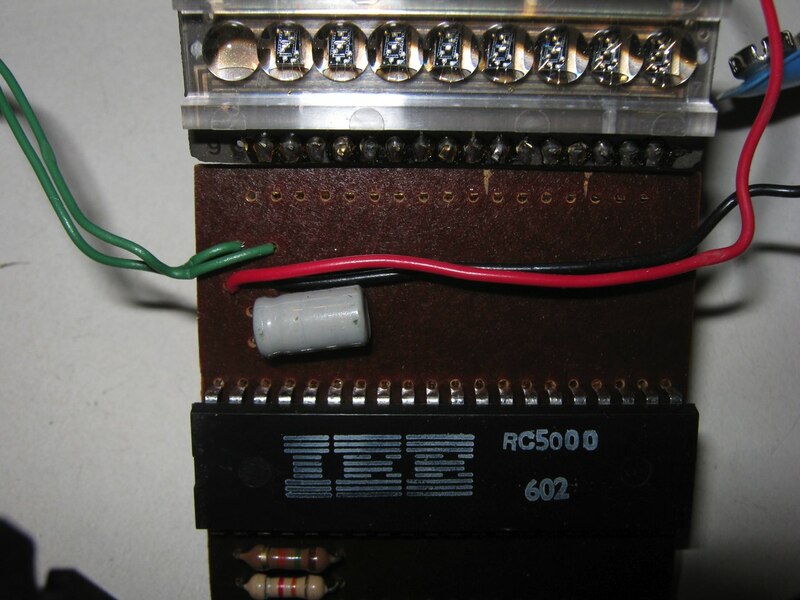 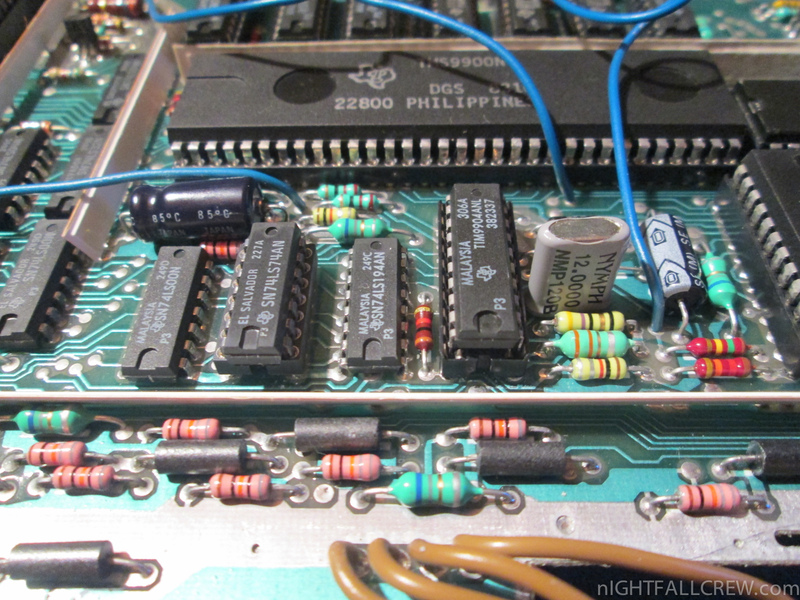 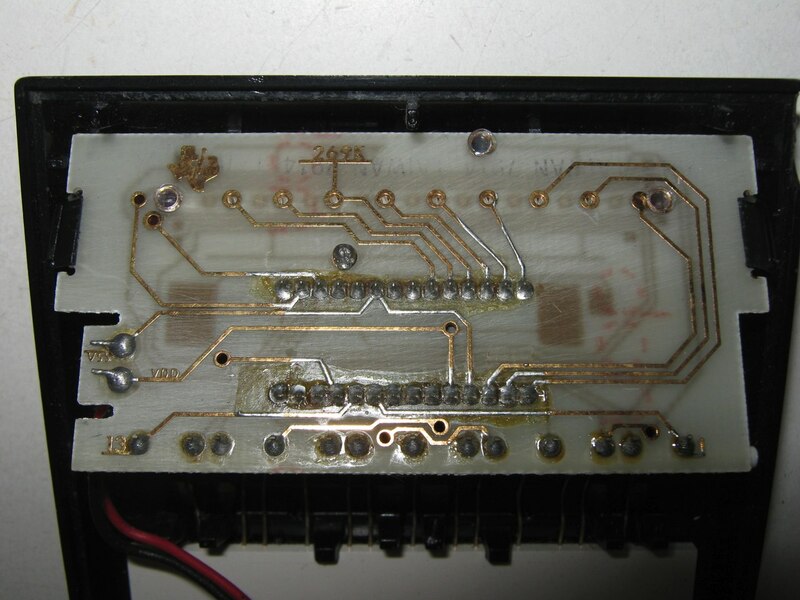 … anyway … i have tried to unsolder and put a socket. 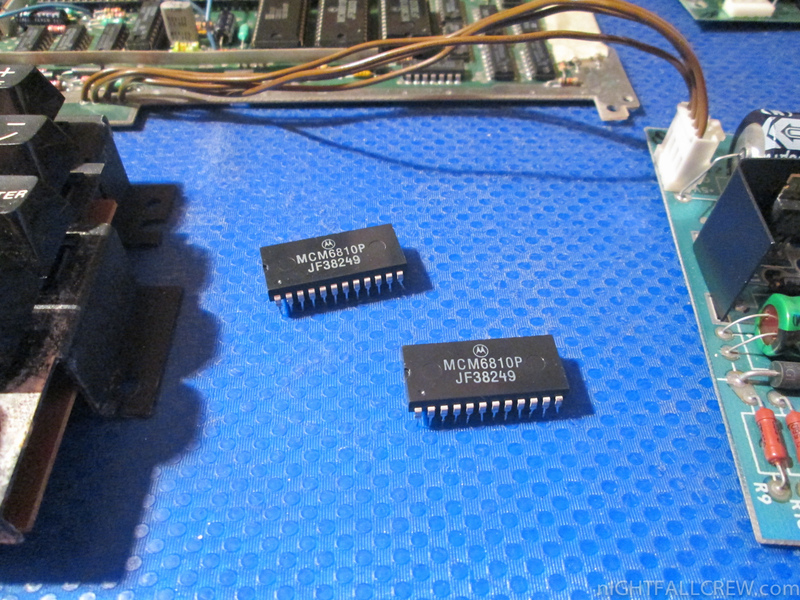 Et Voilà the two MCM6810P are both dead! 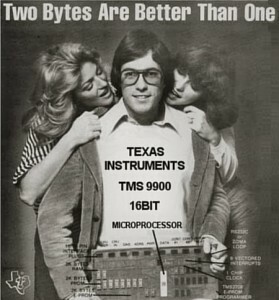 both! 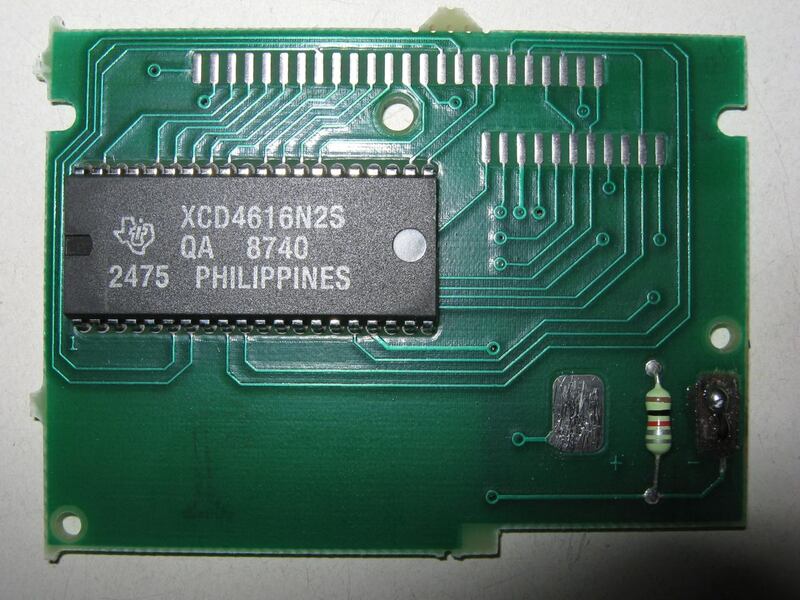 Obviously i don’t have this component in my laboratory, then i try to recover from the motherboard for spare these two RAM hoping that they are not faulty which however these RAM can be purchased online at a very low price. 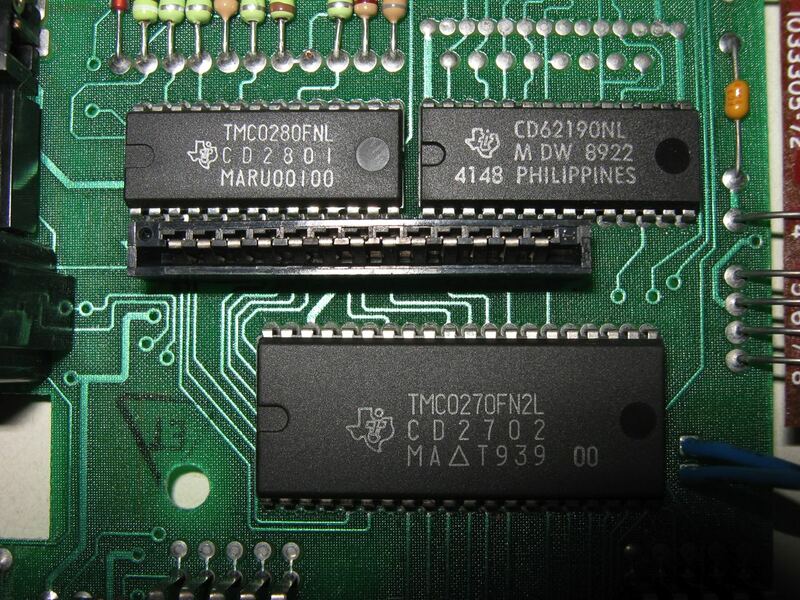 The fifth and last motherboard that had the same defect of the previous one did not have the faulty ram MCM6810P. 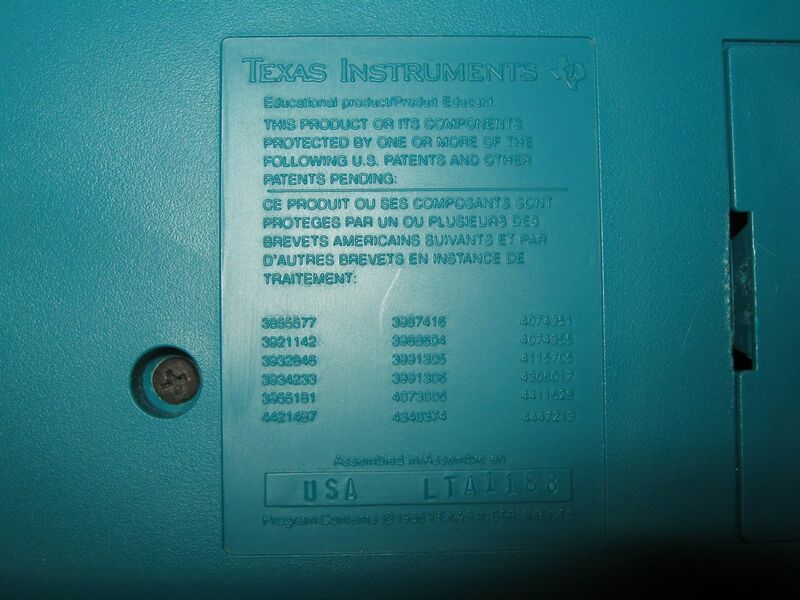 The Texas Instruments TI-99/4A was an early home computer, released in June 1981, originally at a price of US$525. 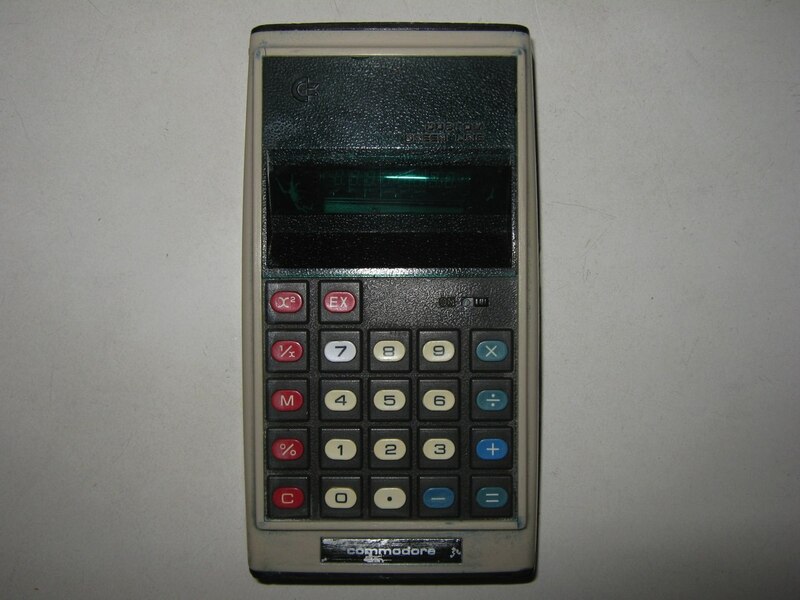 It was an enhanced version of the less successful TI-99/4 model, which was released in late 1979 at a price of $1,150. 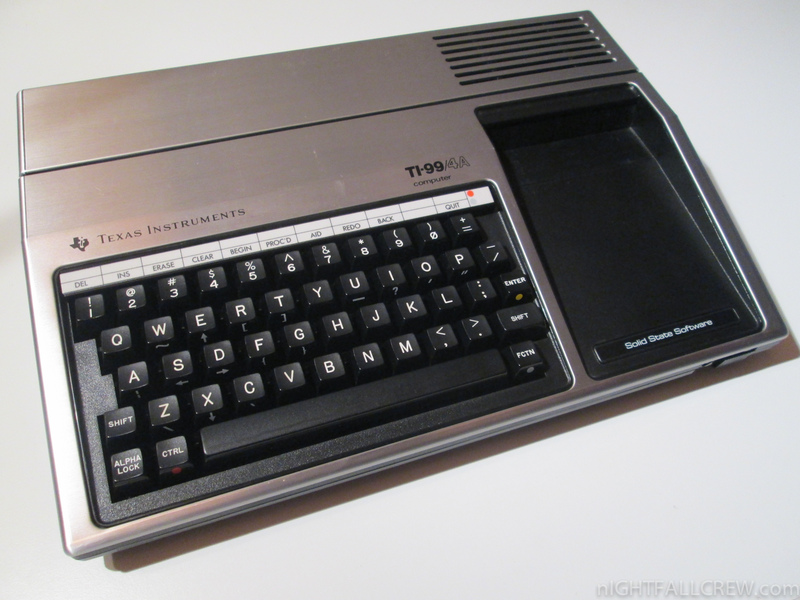 The TI-99/4A added an additional graphics mode, “lowercase” characters consisting of small capitals, and a full travel keyboard. Its predecessor, the TI-99/4, featured a calculator-style chiclet keyboard and a character set that lacked lowercase text. 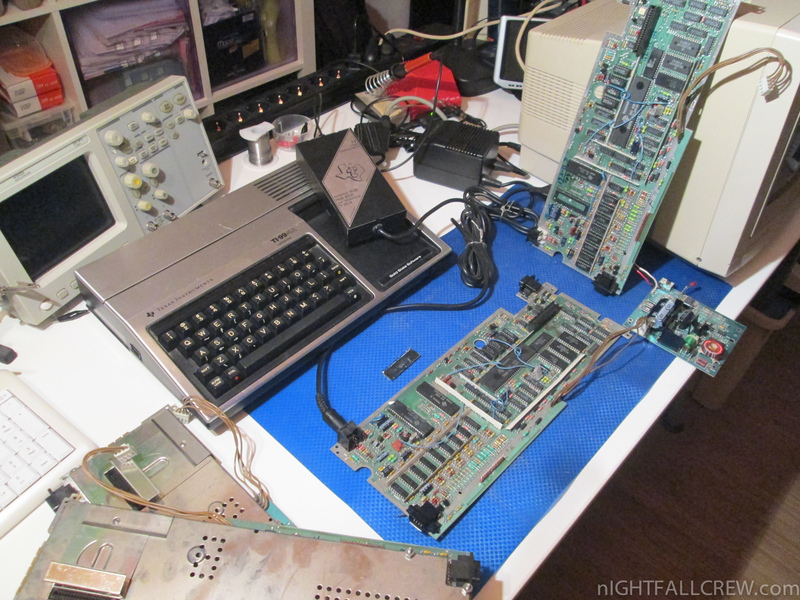 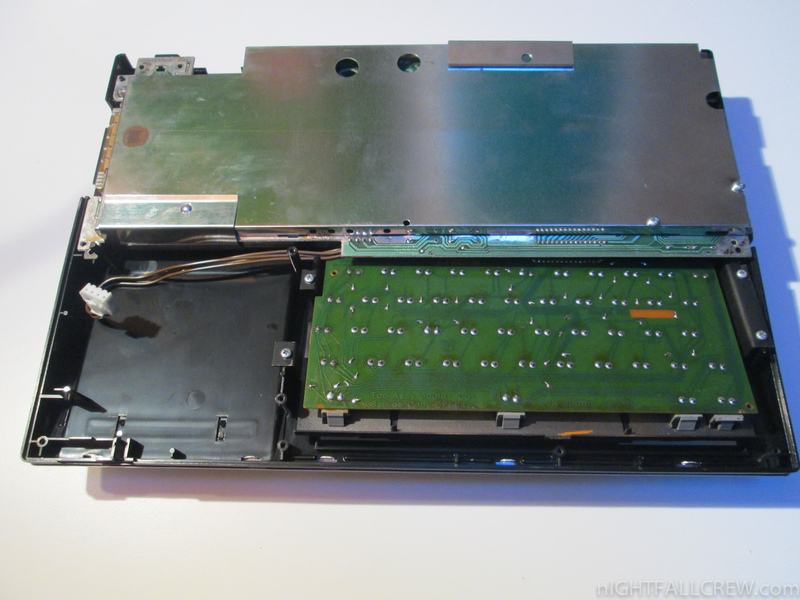 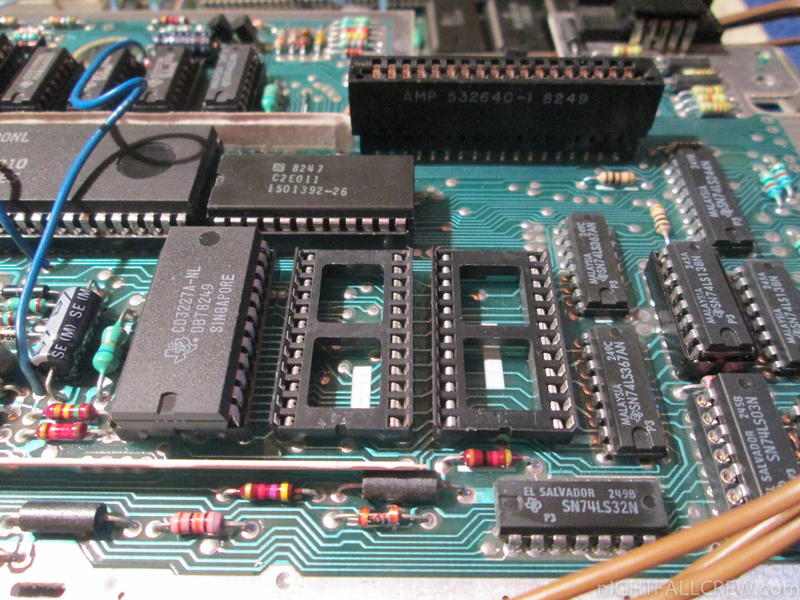 The TI-99/4A’s CPU, motherboard, and ROM cartridge (“Solid State Software”) slot were built into a single console, along with the keyboard. 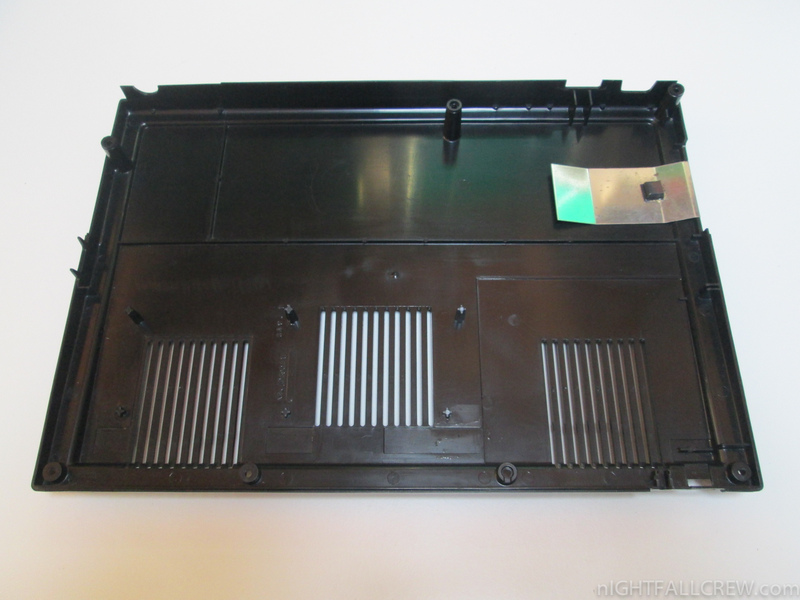 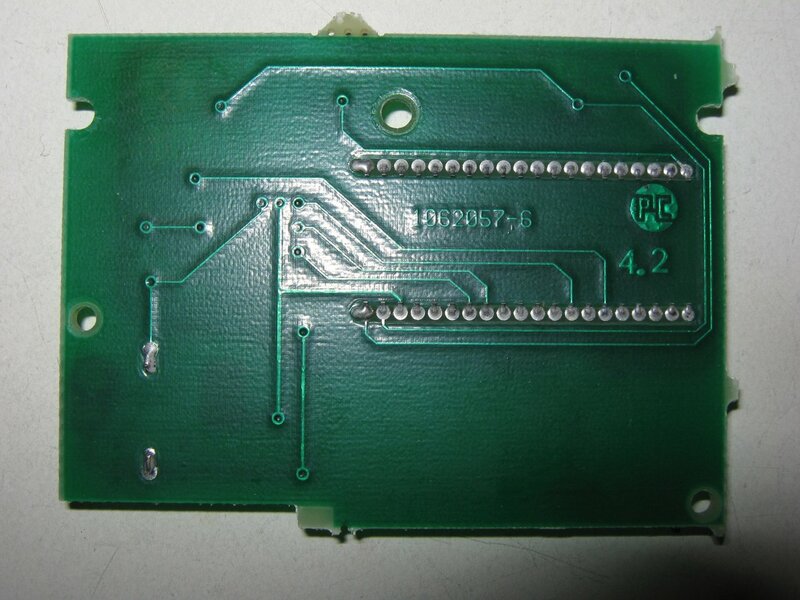 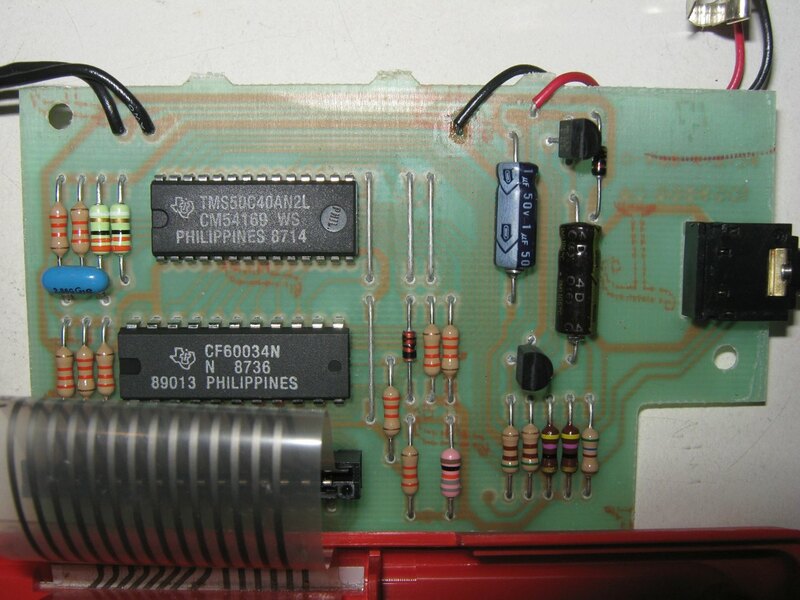 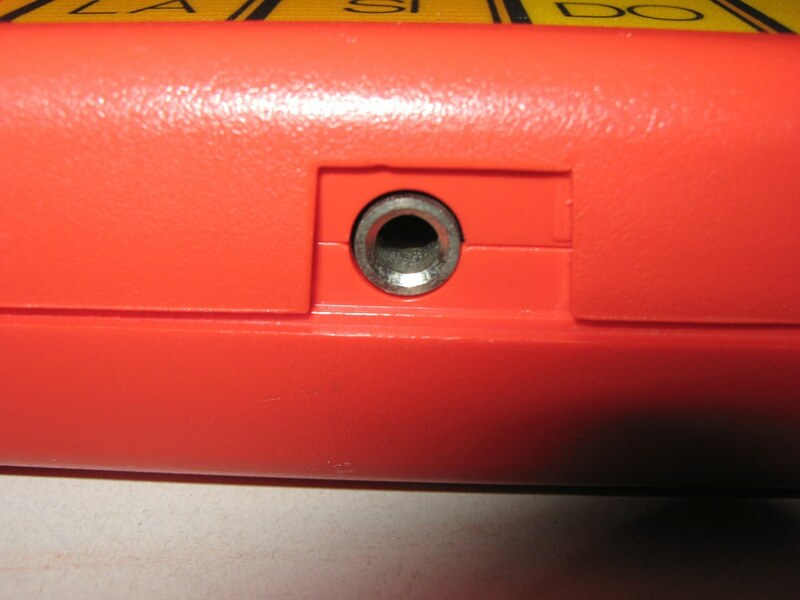 The power regulator board is housed below and in front of the cartridge slot under the sloped area to the right of the keyboard. 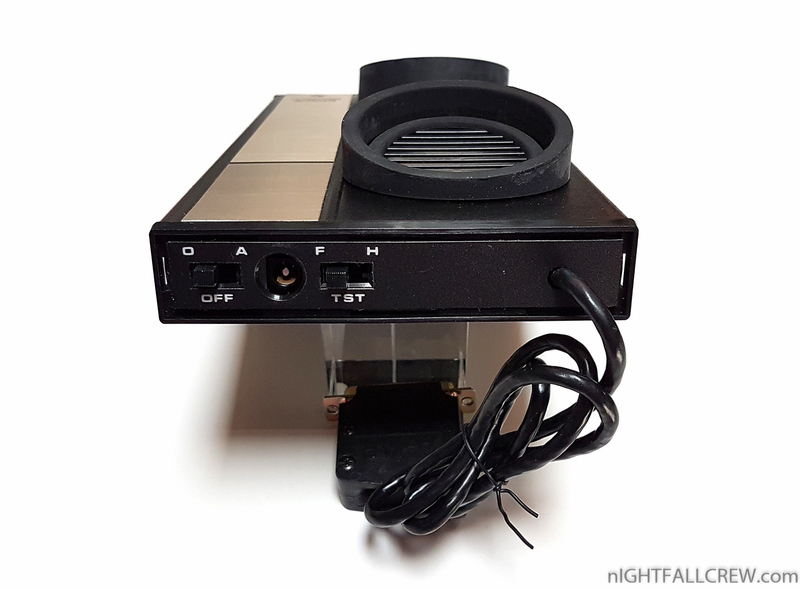 This area gets very hot so users commonly refer to it as the “coffee cup warmer”. 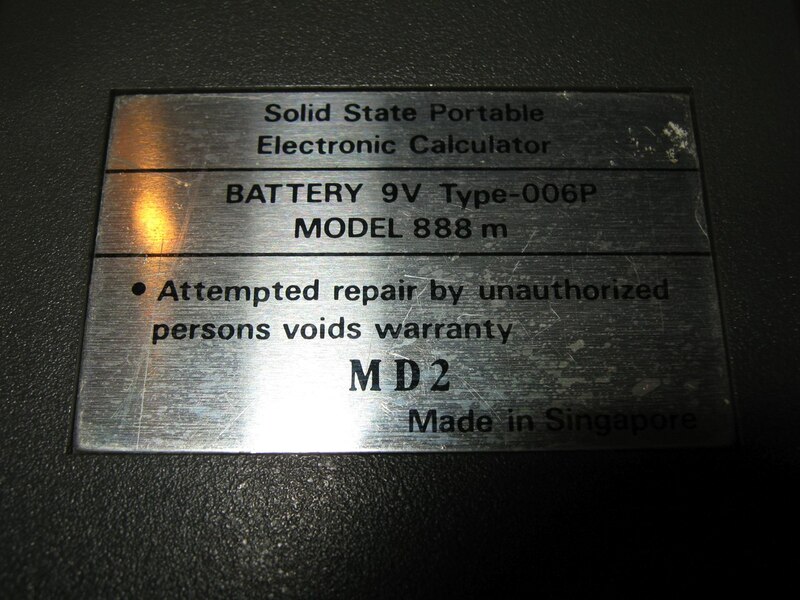 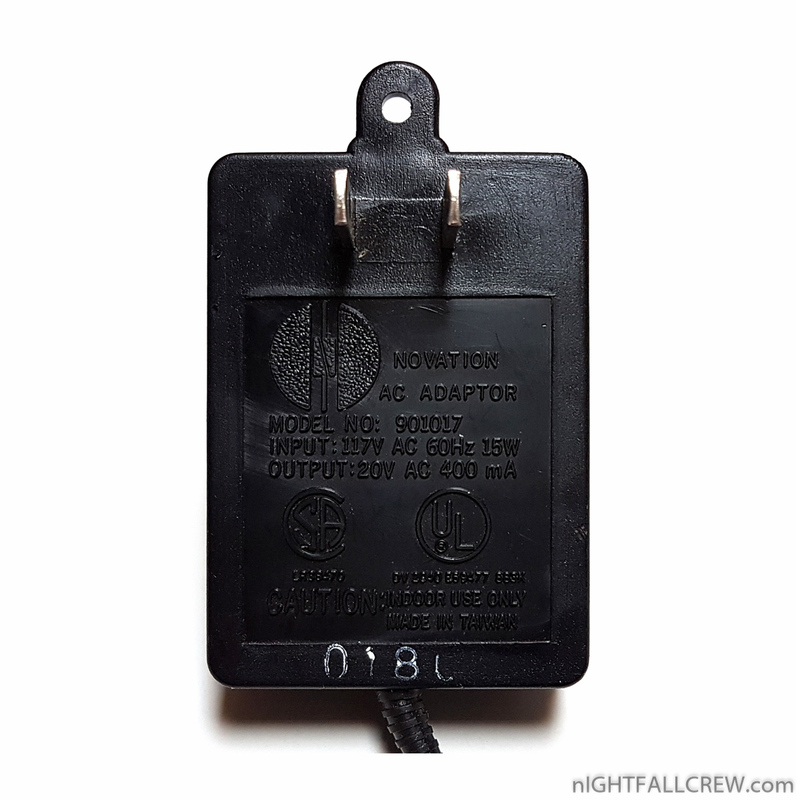 The external power supply, which was different according to the country of sale, was merely a step-down transformer. 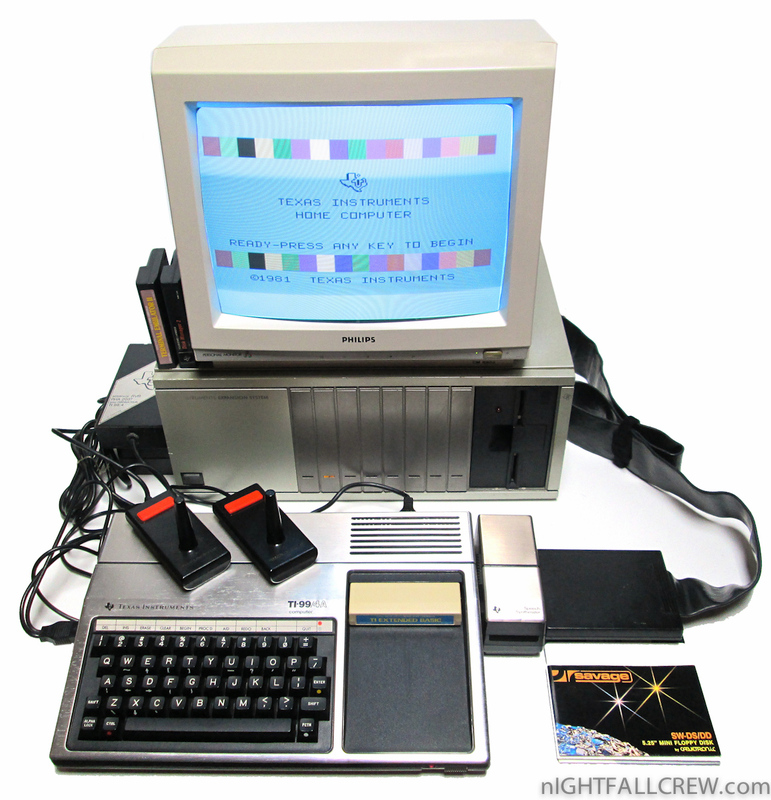 Available peripherals included a 5¼” floppy disk drive and controller, an RS-232 card comprising two serial ports and one parallel port, a P-code card for Pascal support, a thermal printer, an acoustic coupler, a tape drive using standard audio cassettes as media, and a 32 KB memory expansion card. 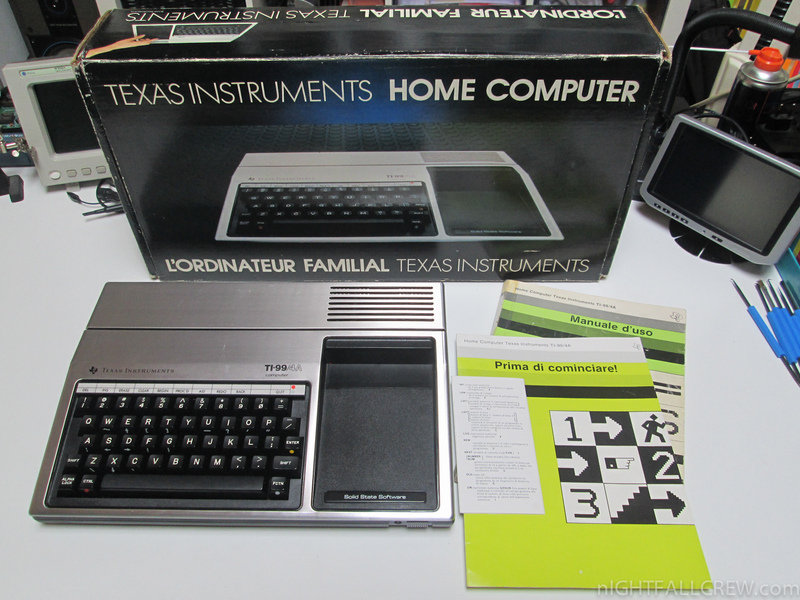 The TI-99/4 was sold with both the computer and a monitor (a modified 13″ Zenith Color TV) as Texas Instruments could not get their RF Modulator FCC approved in time. 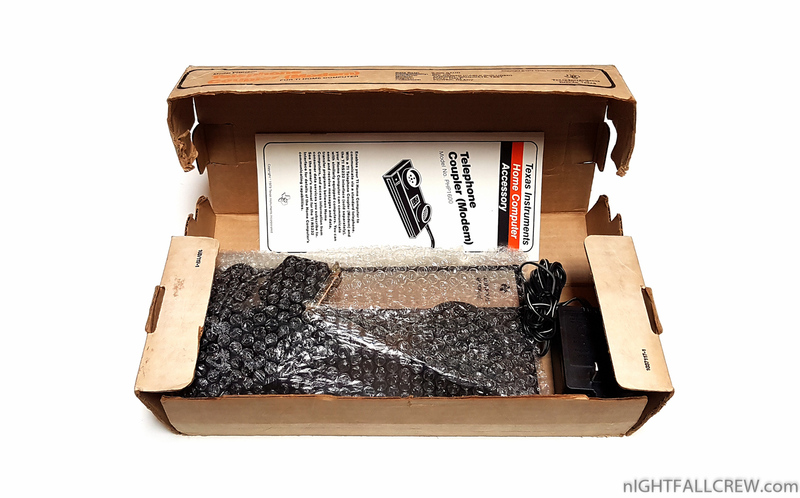 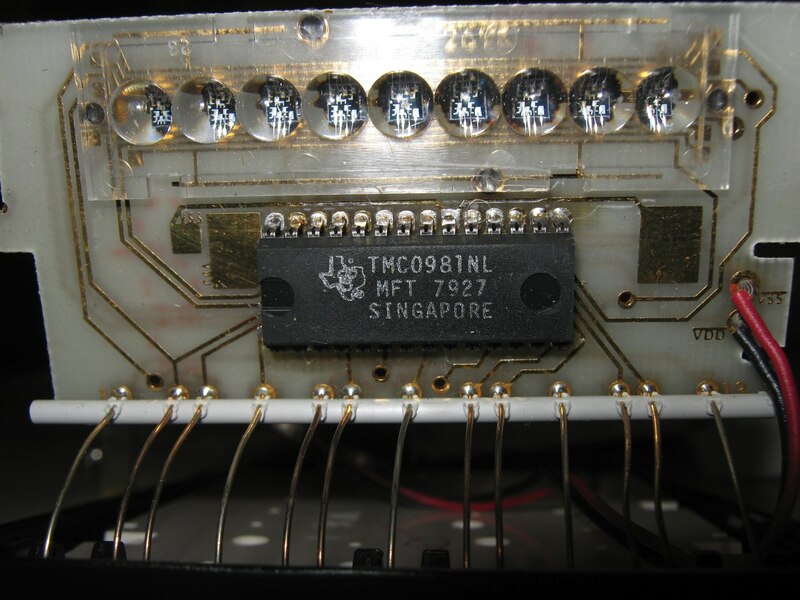 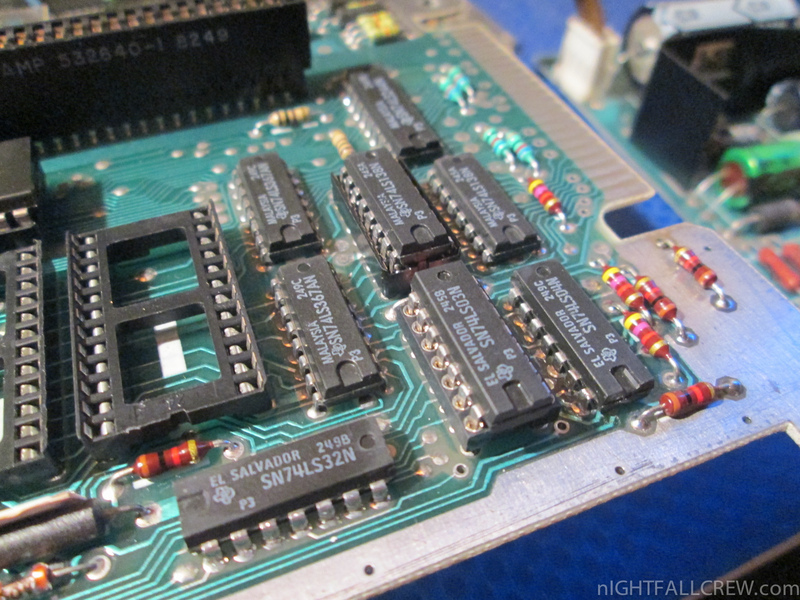 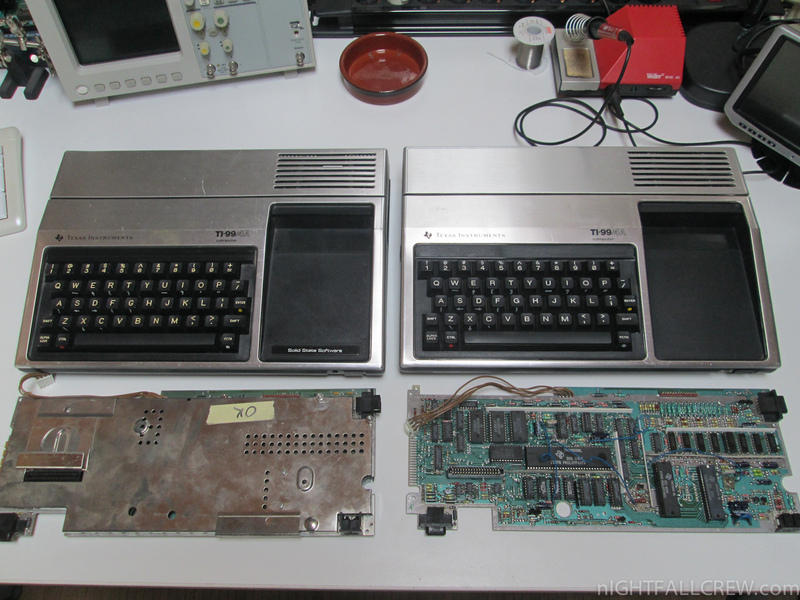 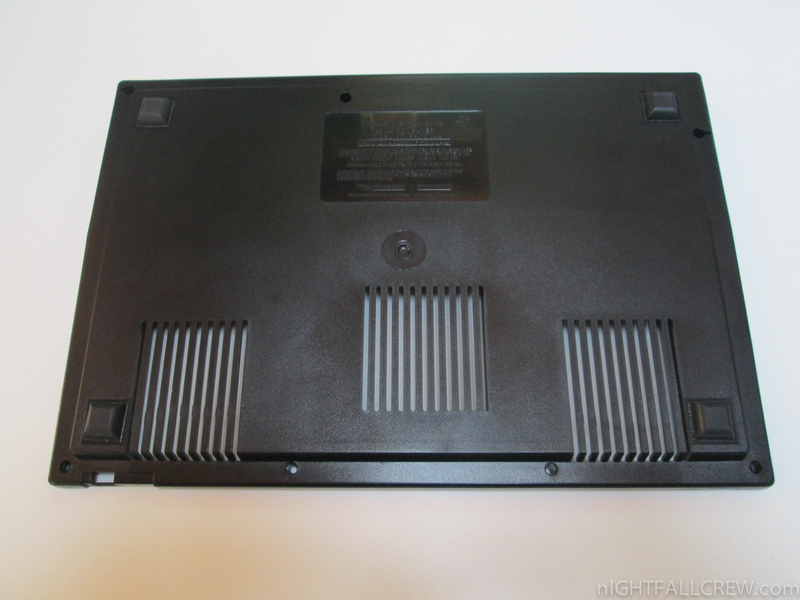 The TI-99/4A did ship with an RF Modulator. 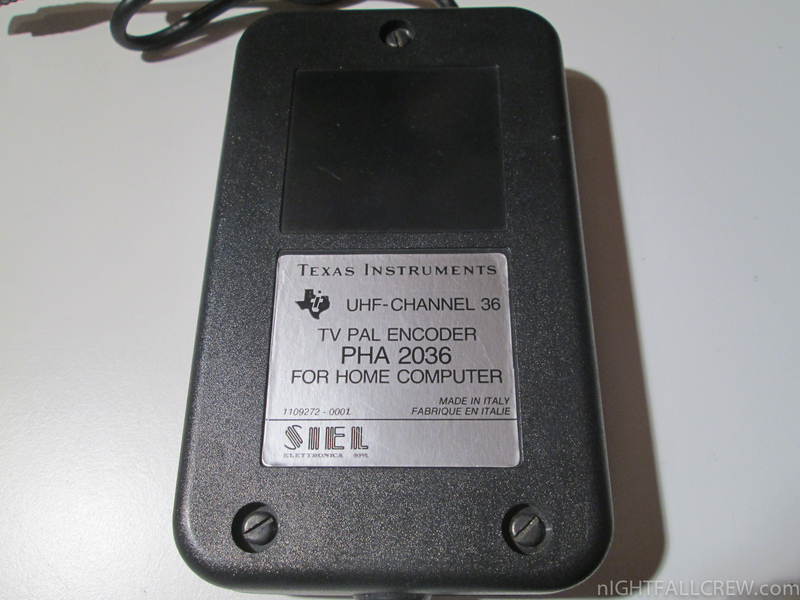 In the early 1980s, TI was known as a pioneer in speech synthesis, and a highly popular plug-in speech synthesizer module was available for the TI-99/4 and 4A. Speech synthesizers were offered free with the purchase of a number of cartridges and were used by many TI-written video games (notable titles offered with speech during this promotion were Alpiner and Parsec). 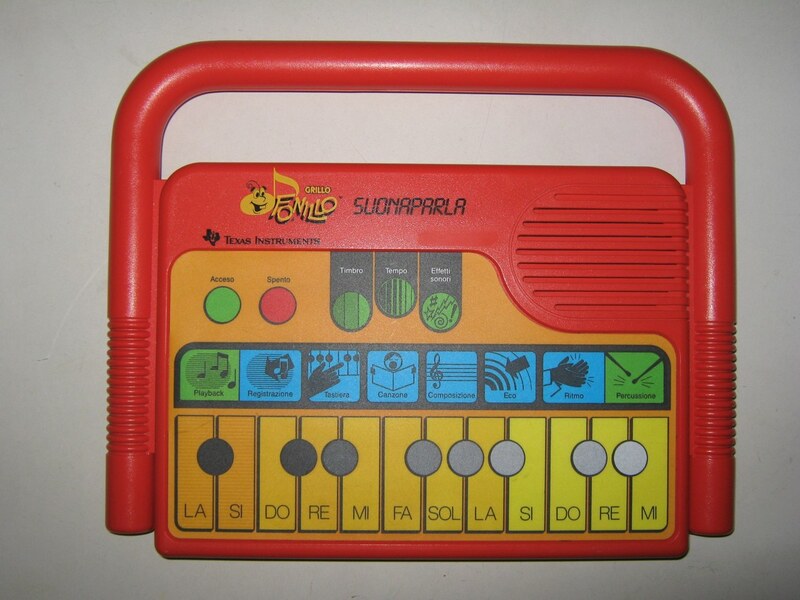 The synthesizer used a variant of linear predictive coding and had a small in-built vocabulary. 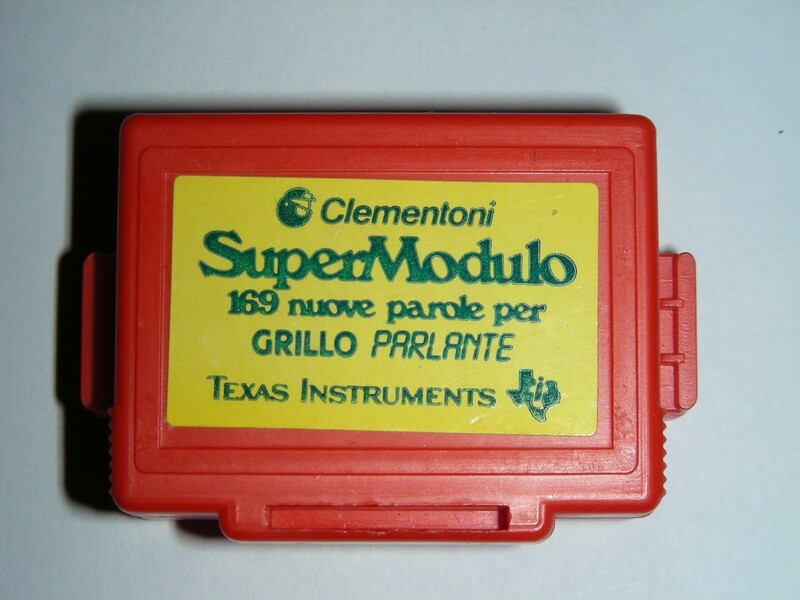 The original intent was to release small cartridges that plugged directly into the synthesizer unit, which would increase the device’s built in vocabulary. However, the success of software text-to-speech in the Terminal Emulator II cartridge cancelled that plan. 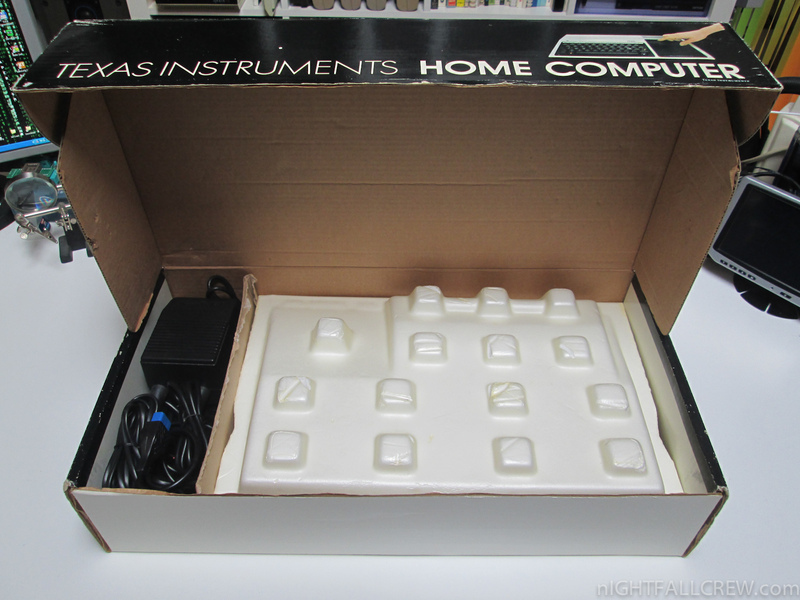 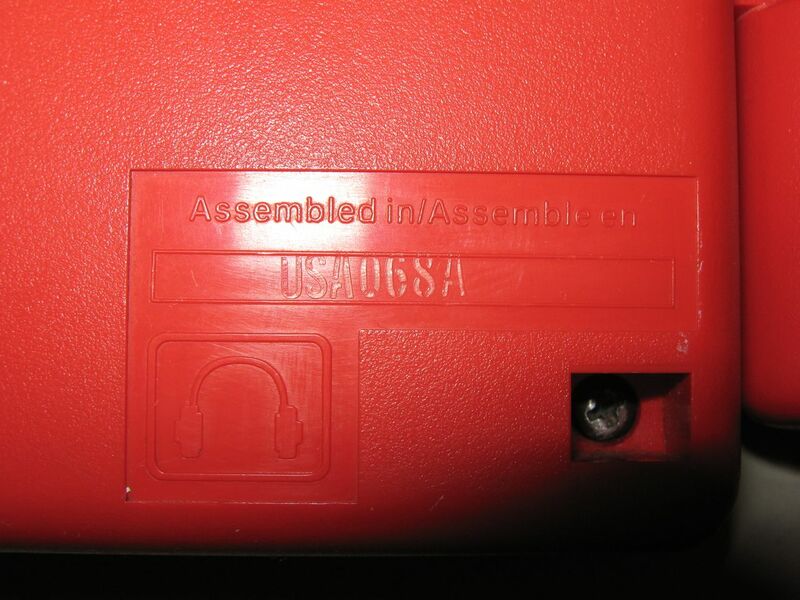 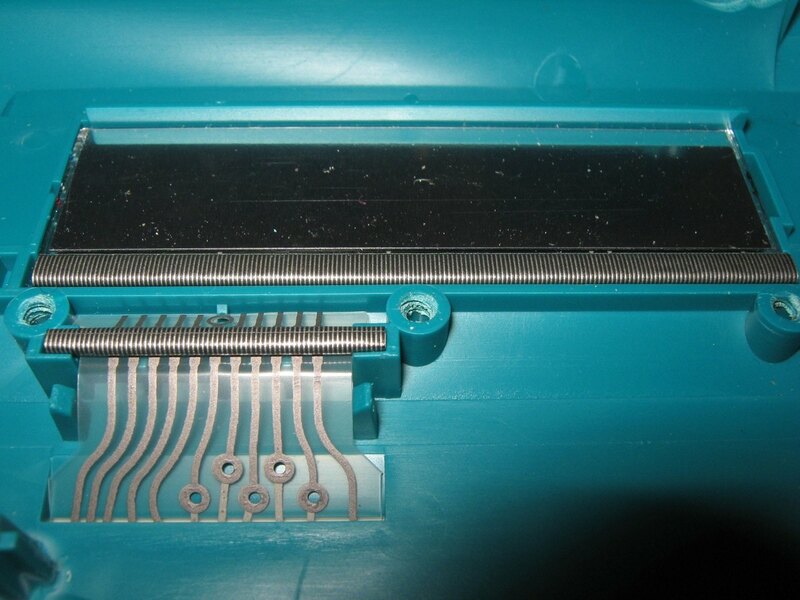 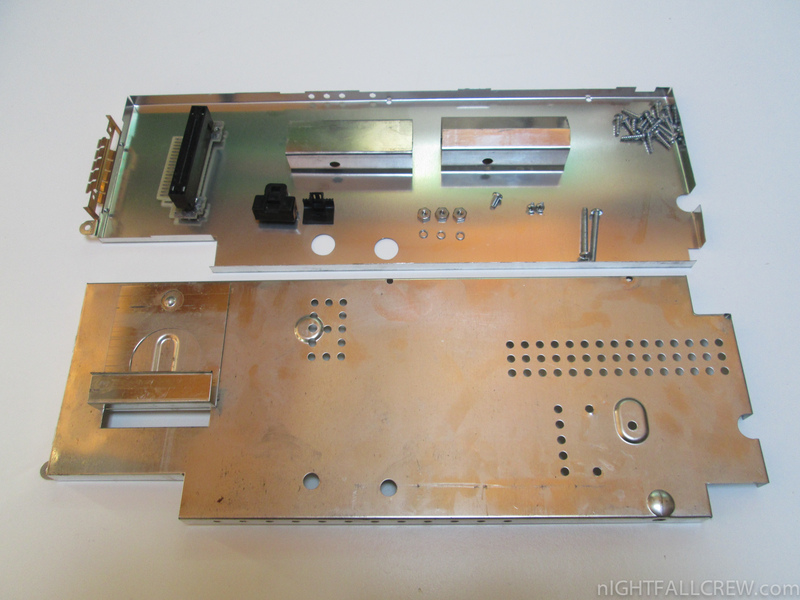 Most speech synthesizers were still shipped with the door that opened on the top, although very few had the connector inside. 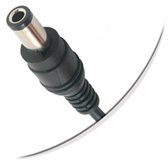 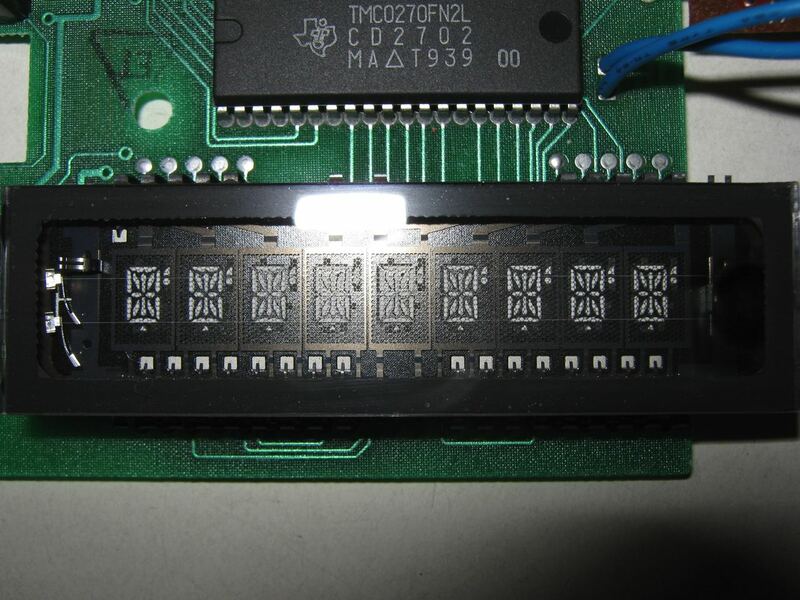 There are no known speech modules in existence for those few units with the connector. 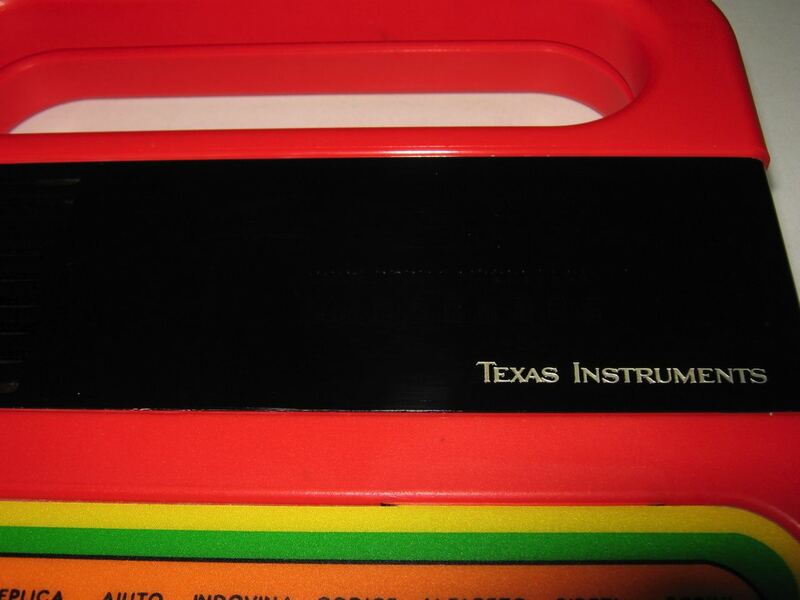 In many games (mostly those produced by TI), the speech synthesizer had relatively realistic voices. 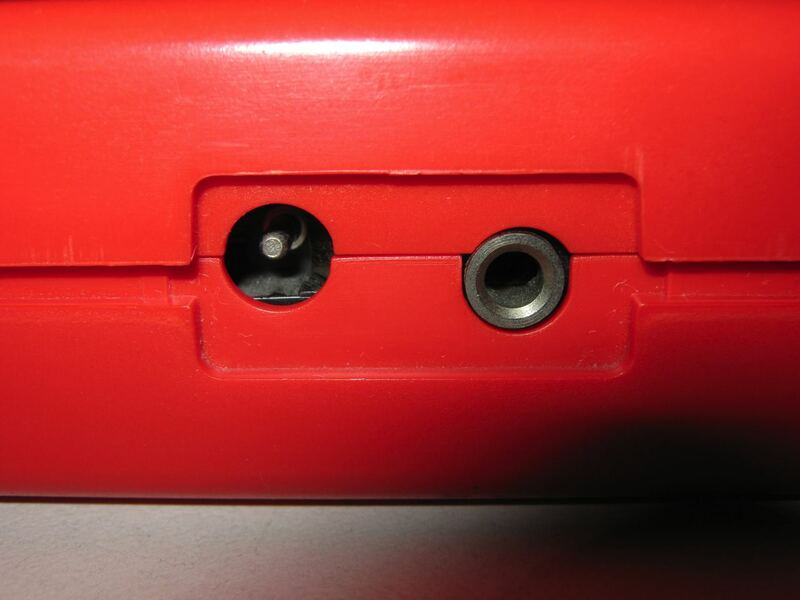 For example, Alpiner’s speech included male and female voices and could be quite sarcastic when the player made a bad move. 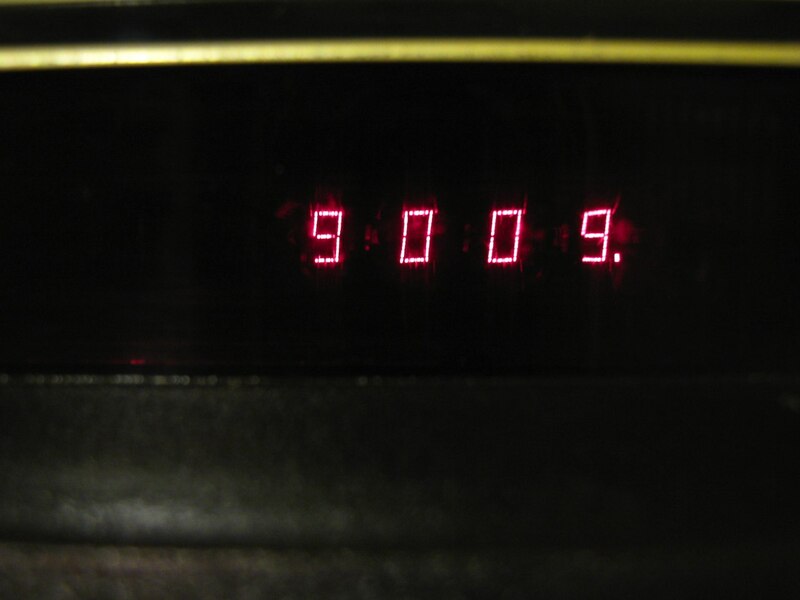 Thanks to My Brother for the Photo. 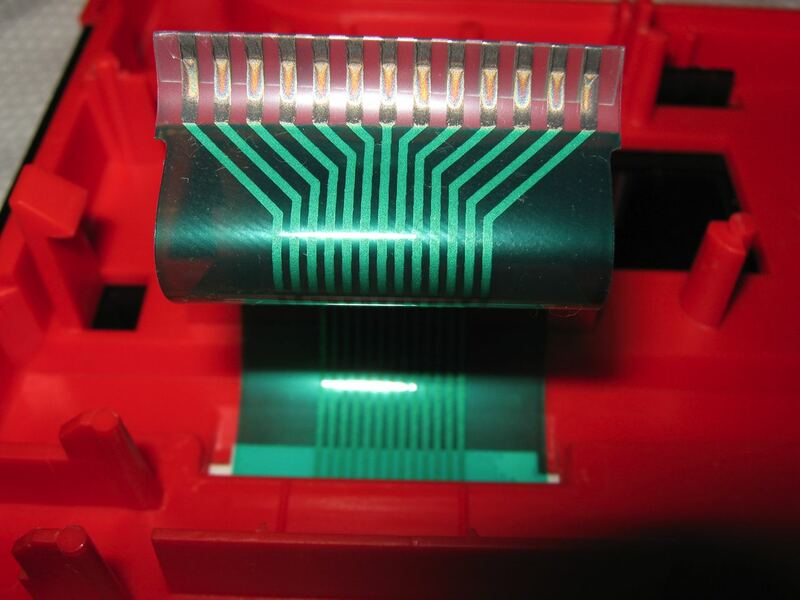 Cartridges (also known as expansion modules) are freely exchangeable ROM libraries that provide additional content without providing additional functionality. 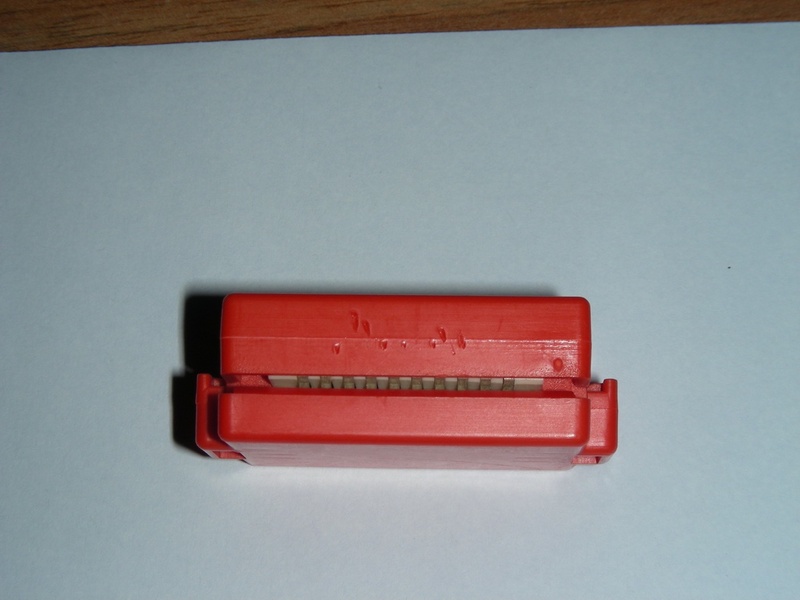 These cartridges are plugged into a slot near the battery compartment in order to introduce new software libraries. 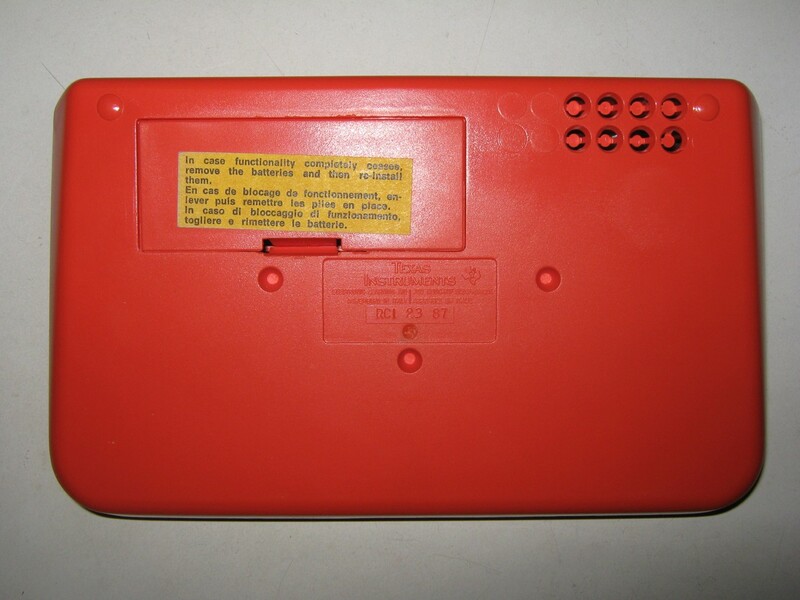 Word and game lists are of differing lengths depending upon the cartridge and the word lists in models marketed for different languages reflect the language marketed for. 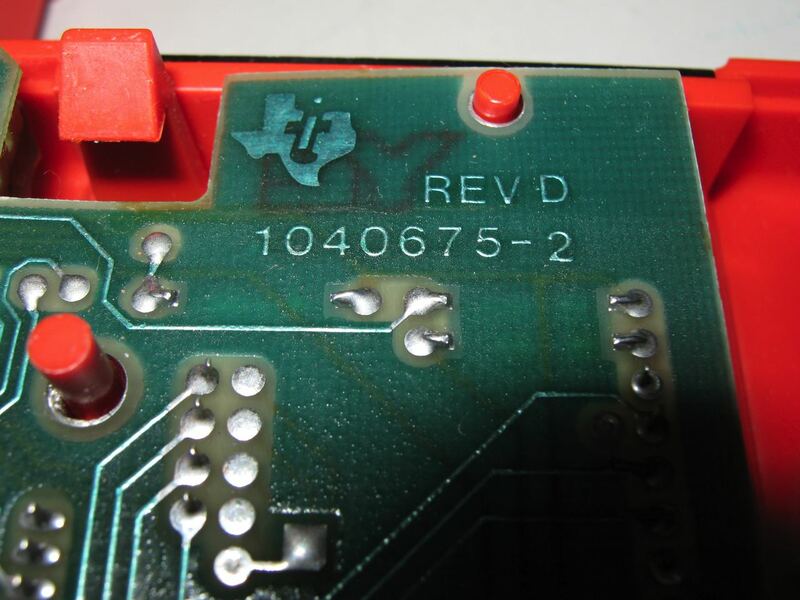 Separate word lists also exist for regional variants such as the American and British English versions. 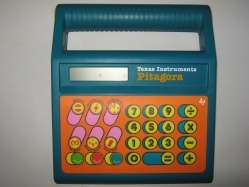 The word list used in each of the regional models reflects the recommendations of educators in each country. 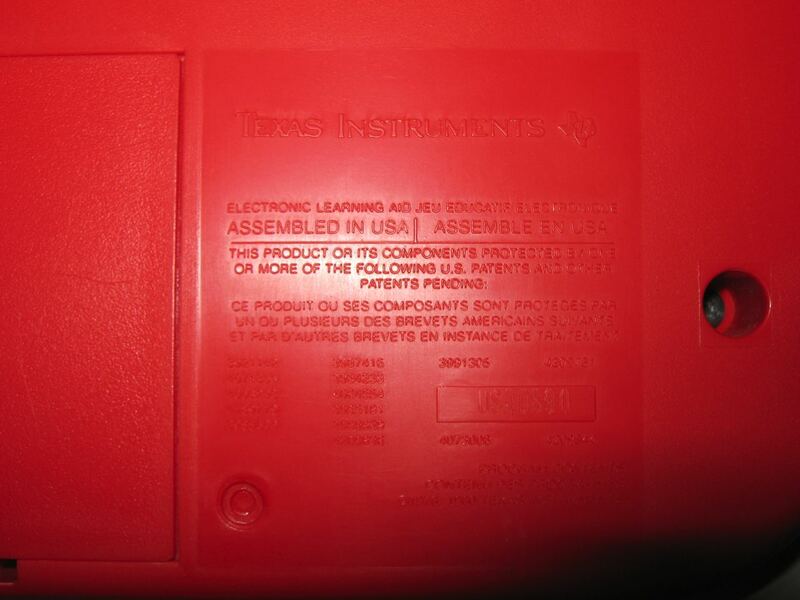 The English, French, German and Italian versions were all created by a team of non-specialists, in TI’s plant near Antibes, France, under the watchful eye of Larry Brantingham who had patented the underlying technology. 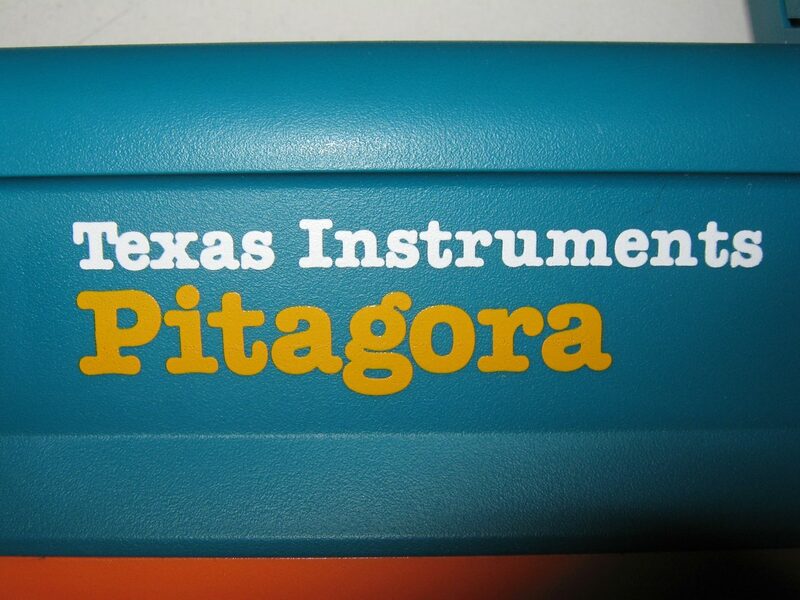 This funny synthesizer based product from Texas Instruments generates a lot of different sounds and stores them into internal memory. 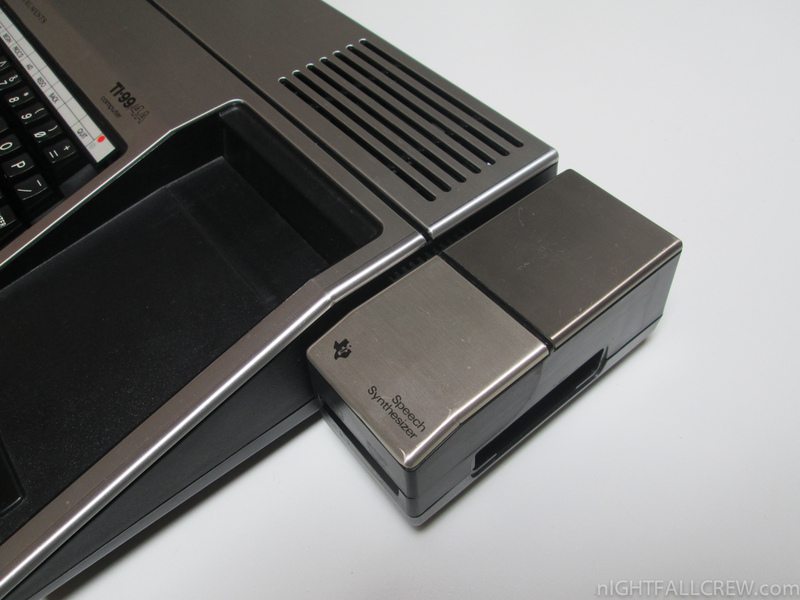 Compared with earlier products of the Speak & line this one uses a quite simple technology. 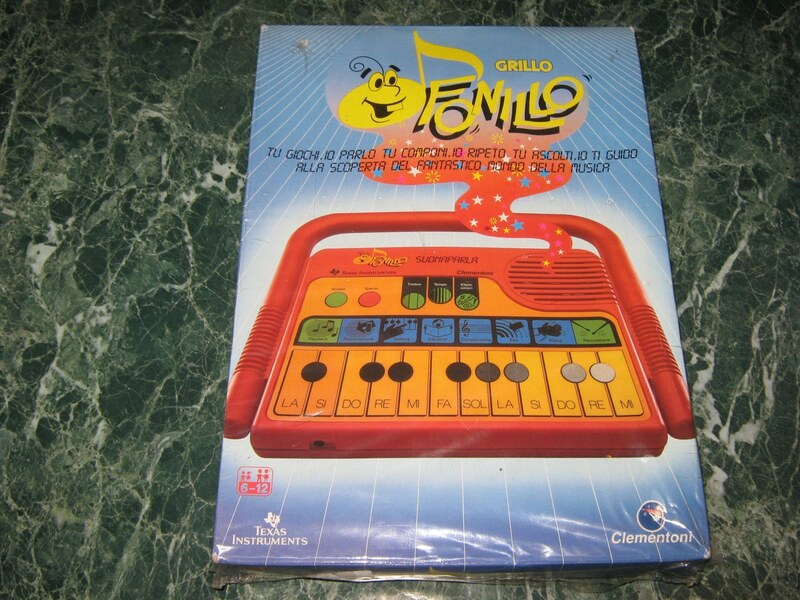 This educational toy is very similar to the Speak & Music but uses an Italian speaking language. 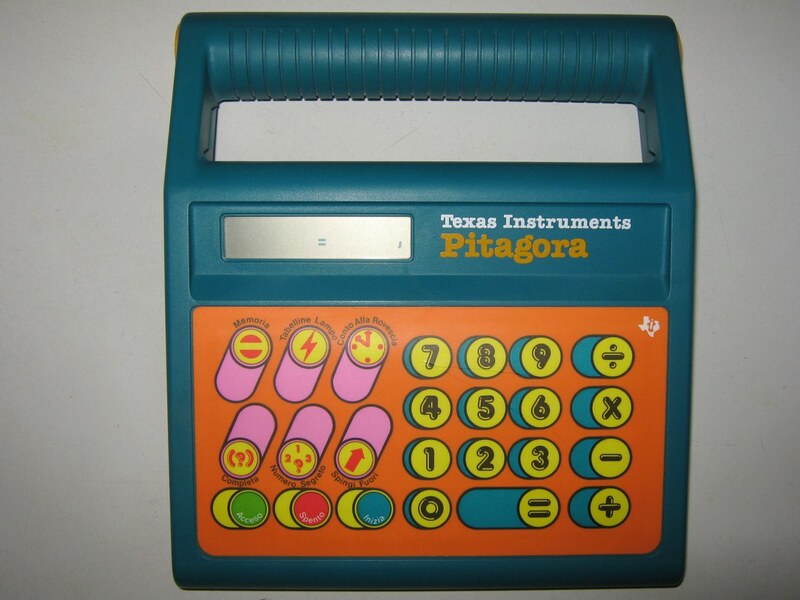 This educational toy for youngsters replaced the Math Marvel. 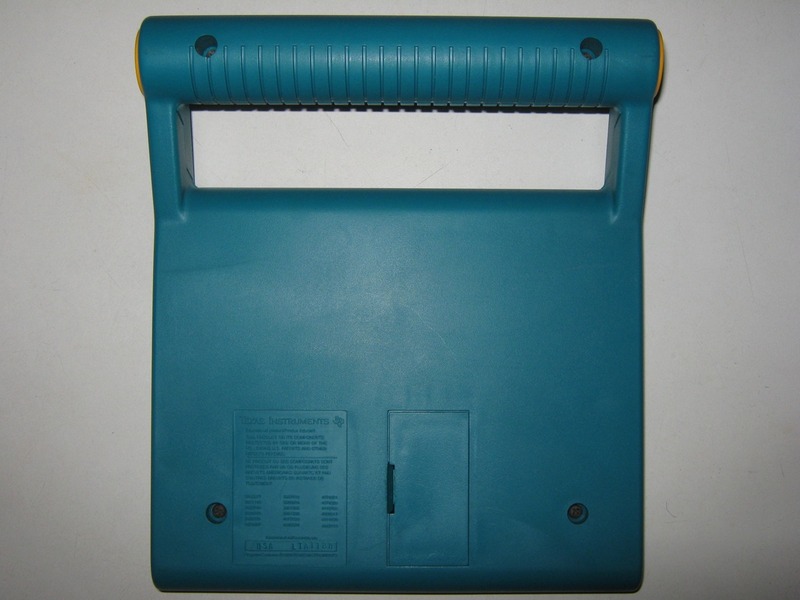 The Math Star is preprogrammed to teach the basic four mathematic functions through different games. 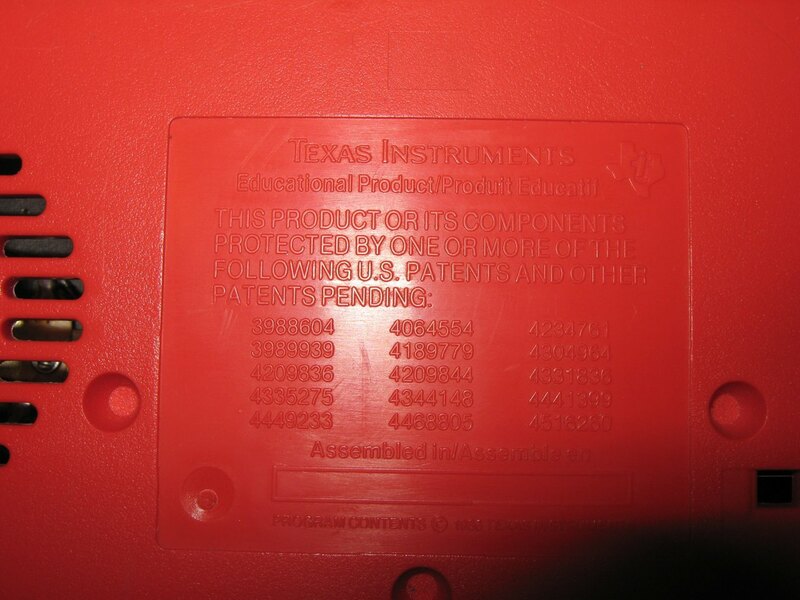 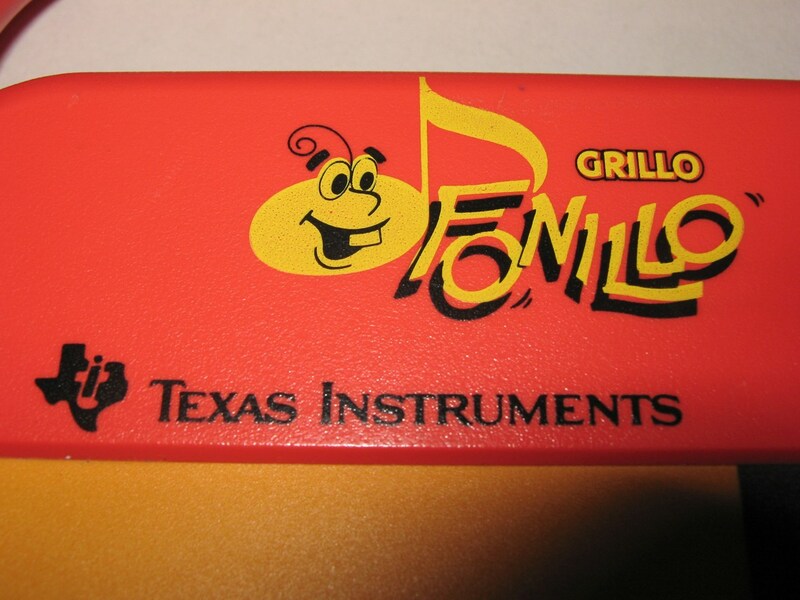 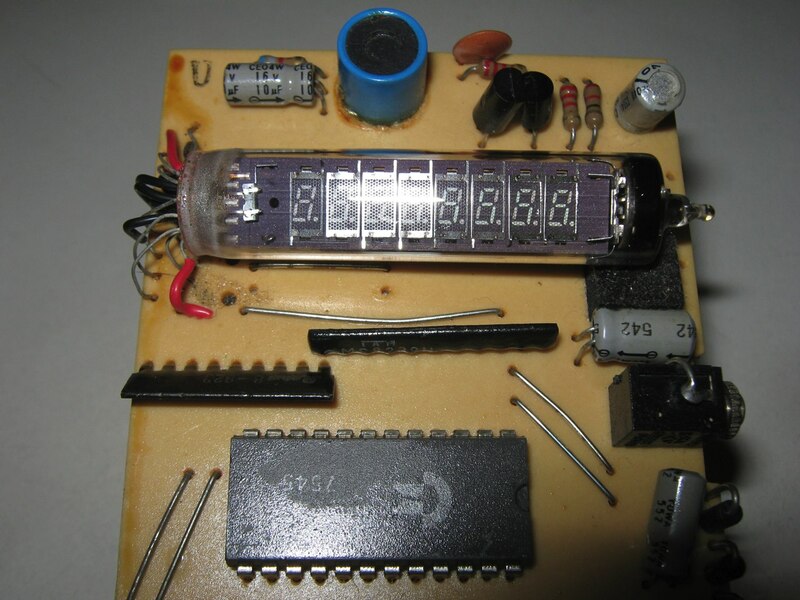 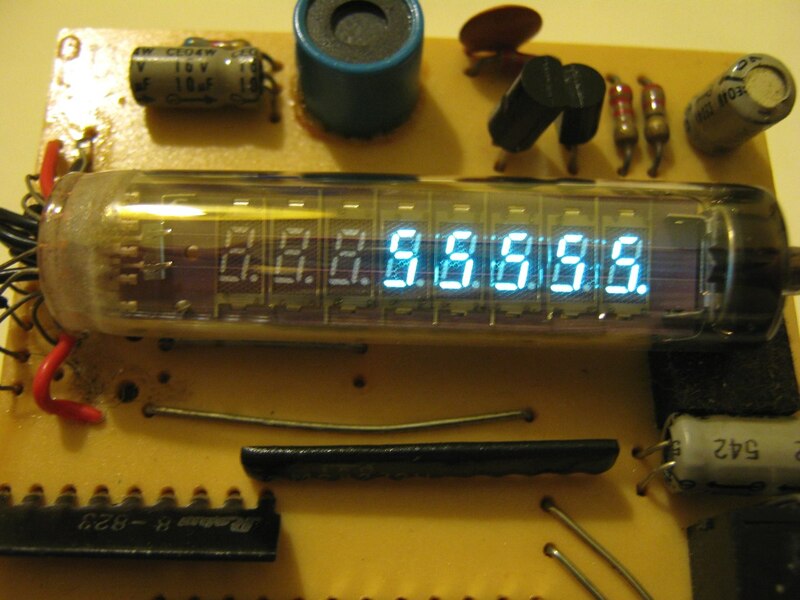 This educational toy was rated by Texas Instruments for childrens aged between 6 and 11 years. 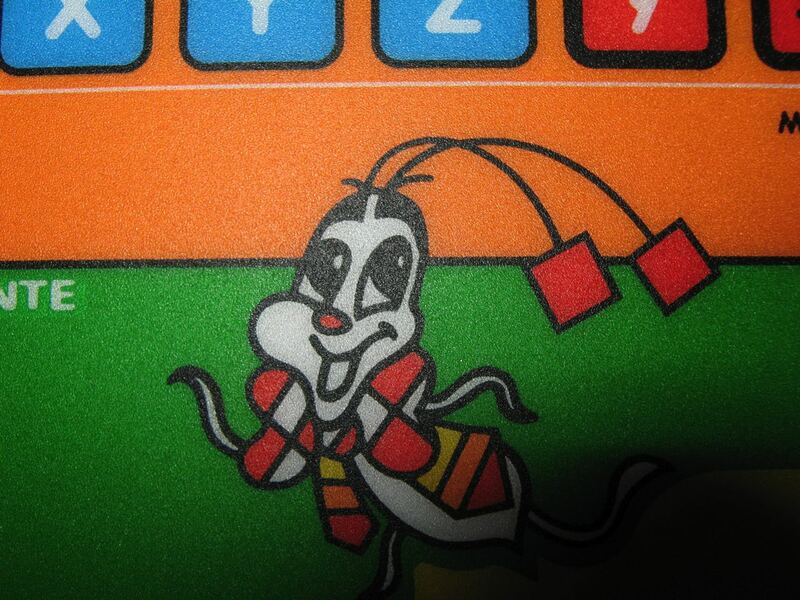 The Math Star shared the housing with the Spelling B teaching word games. 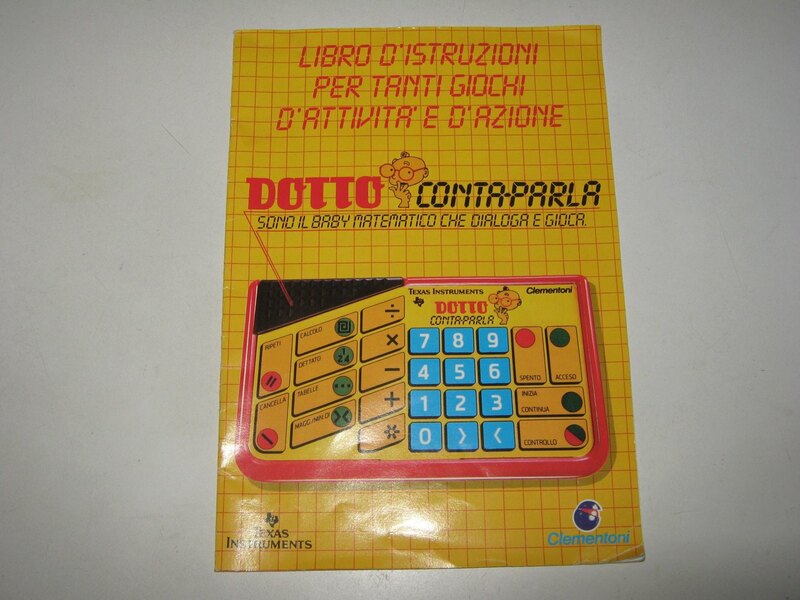 In the United Kingdom the game was sold as Maths Star, in Germany as Mathe-Star, in Italian it was labelled Pitagora and France knows the Les Nombres Magiques. 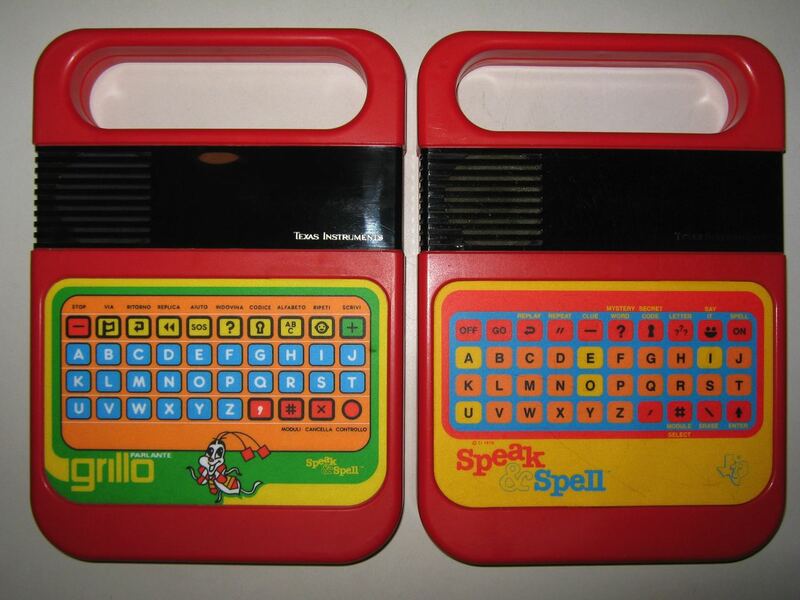 The Speak & Math was published in 1980 with a shape identical to both the Speak & Spell and the Speak & Read but with a completely different keyboard layout, different game features, and a different color scheme. 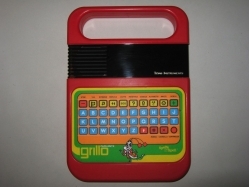 Where the American Speak & Spell had been colored red with yellow and orange accents, the American Speak & Math was gray with blue and orange highlights. 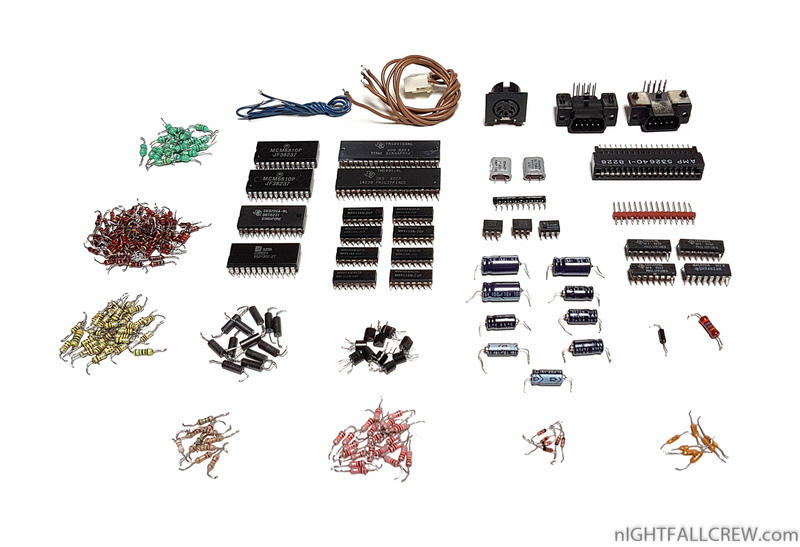 The Speak & Math was designed to focus on mathematics in children of ages 6–12 with a library of over 100,000 random and preprogrammed problems. 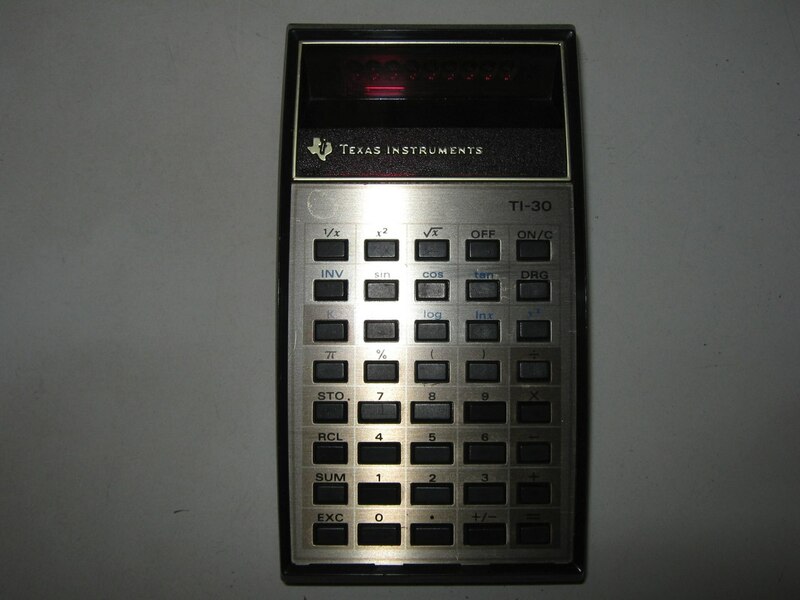 It was regarded as the spiritual successor to TI’s earlier DataMan series, with the difference mainly relating to the addition of speech synthesizing software and the visual display. 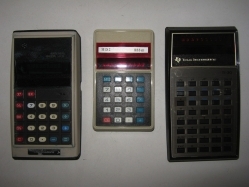 The Speak & Math was only released to American and British markets. 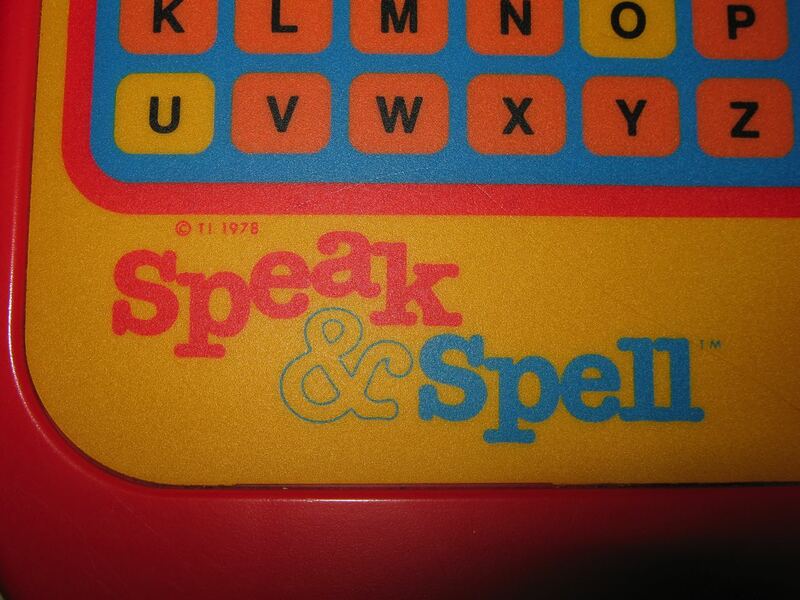 In 1982, a compact version of the Speak & Math was developed contemporaneously with the Speak & Spell Compact. 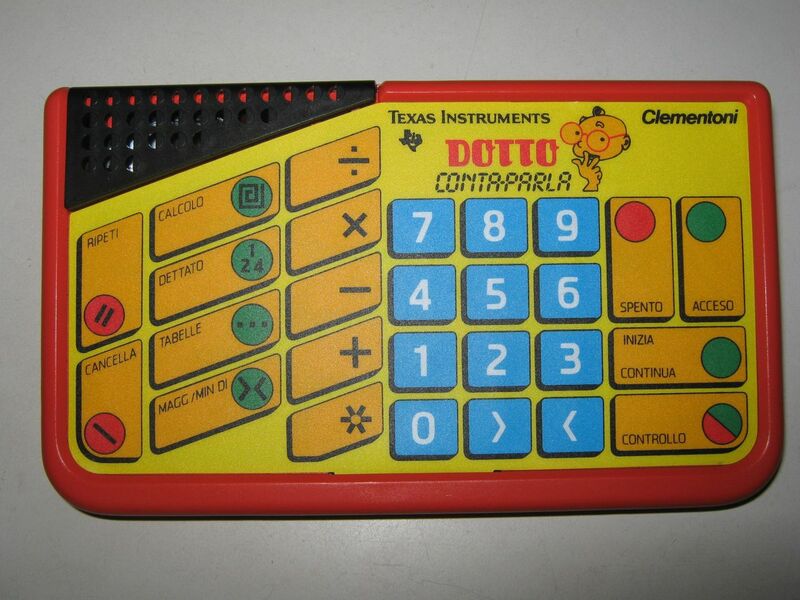 This version was only released in French as Les Maths Magique (lit. 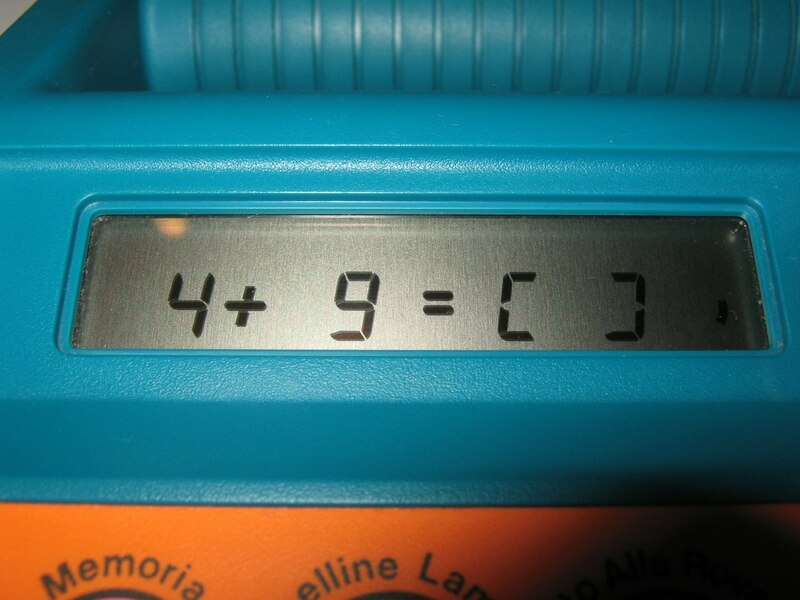 The Magical Math). 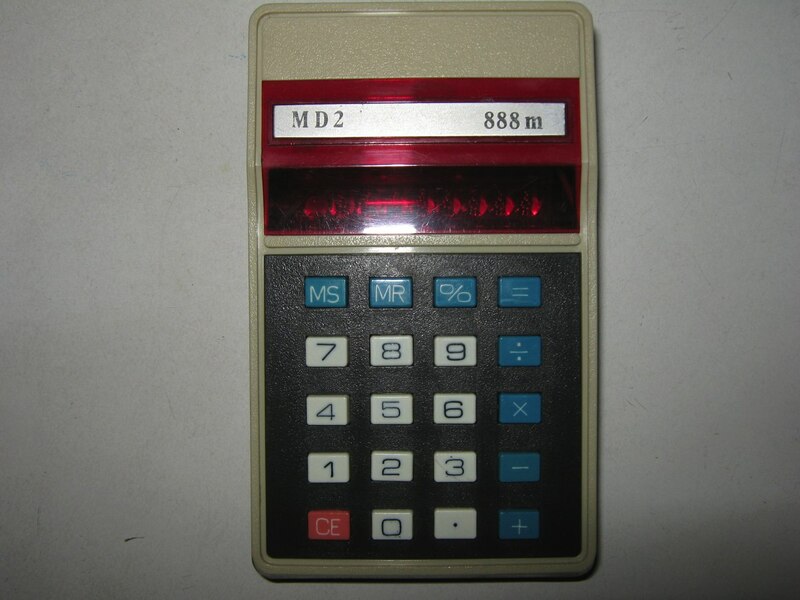 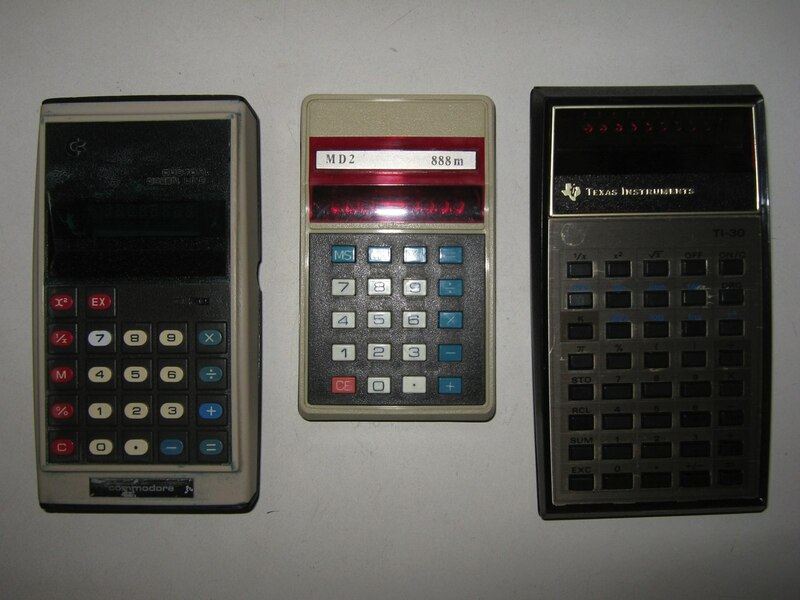 A redesigned version was developed in 1985 for British markets under the name of Maths marvel. 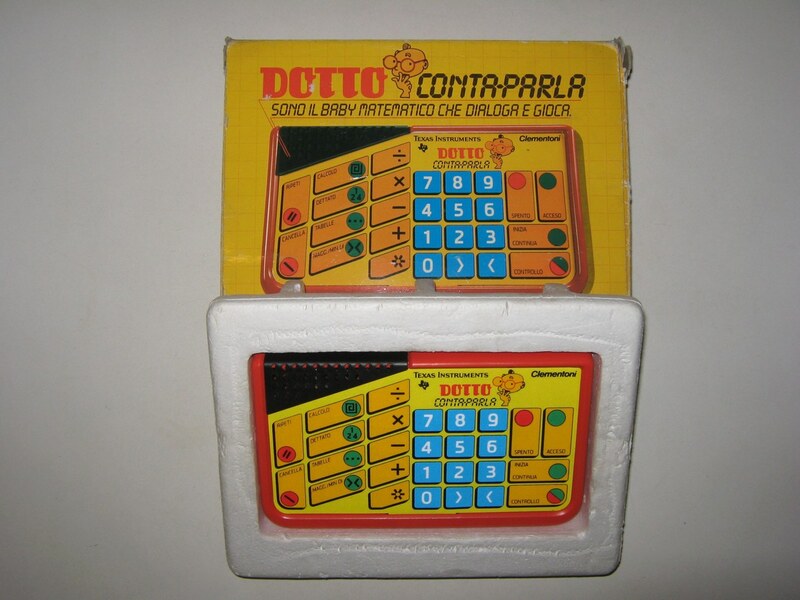 This was later released in Italian as Dotto Conta-Parla, in French as le Calcul magique (lit. 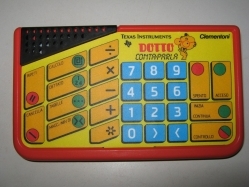 Magical Calculator), and in German as Mathe-Fix. 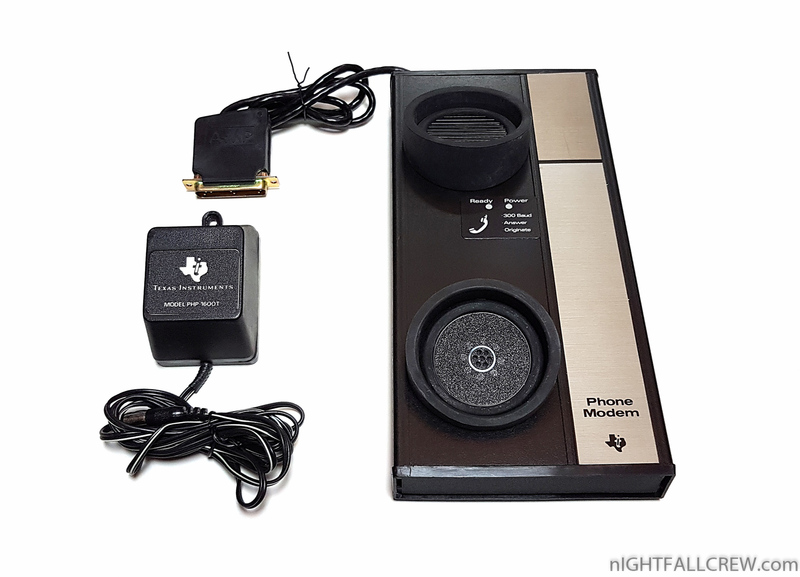 The Speak & Math was very minutely redesigned in 1986, under the same name, with the new version representing nothing more substantial than a redesign of the faceplate graphics. 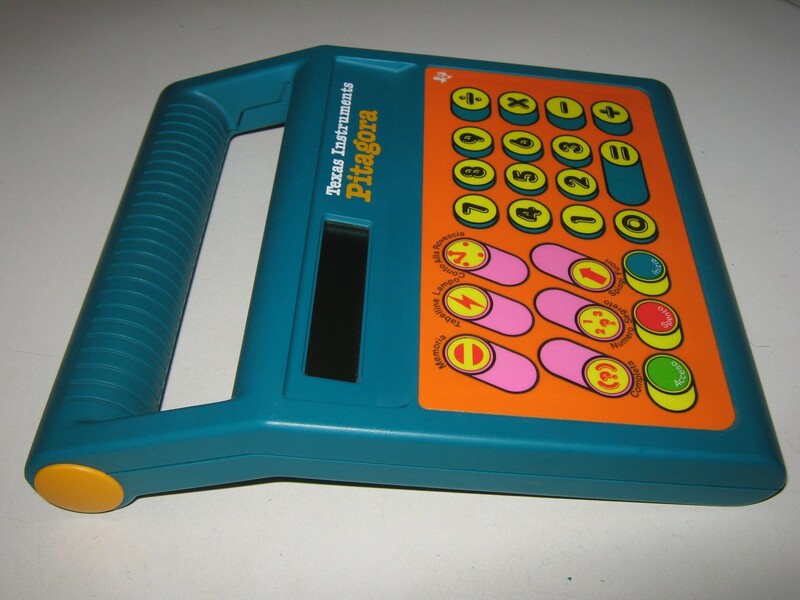 In 1990 the Super Speak & Math was released as a major redesign similar to the first version of the Super Speak & Spell. 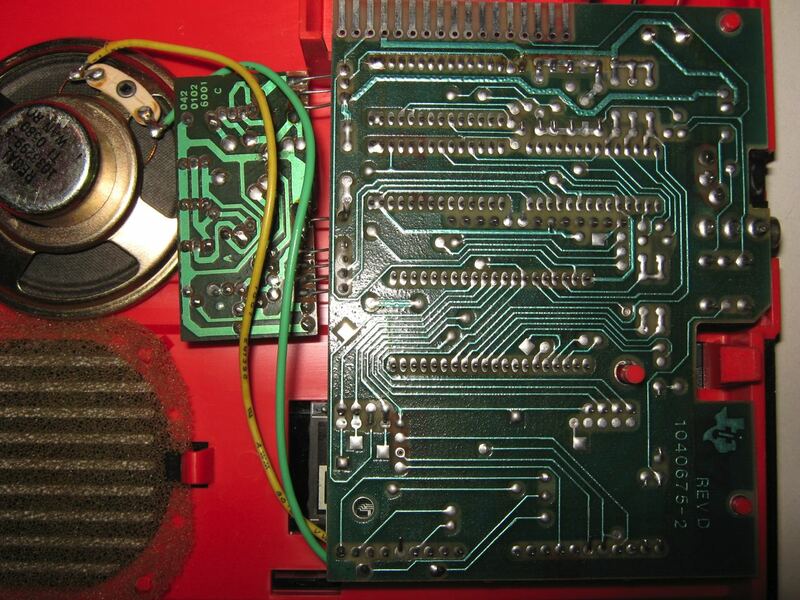 As with the Super Speak & Spell, the display screen of the Super Speak & Math was changed to an LCD screen instead of the former VFD screen. 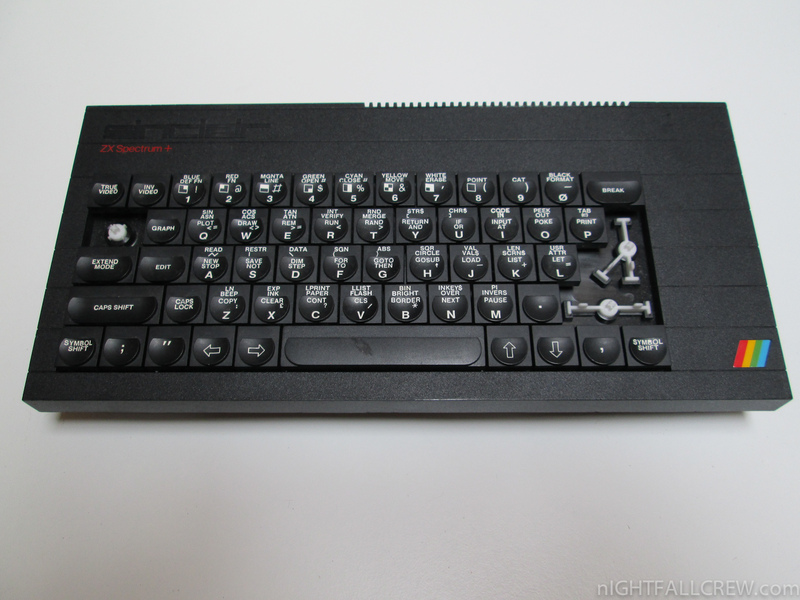 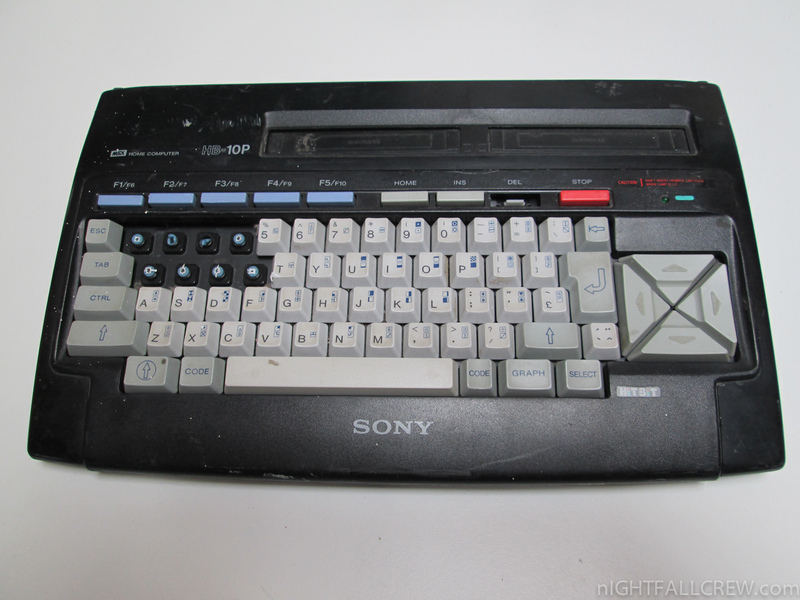 The keyboard was also expanded and given more functions. 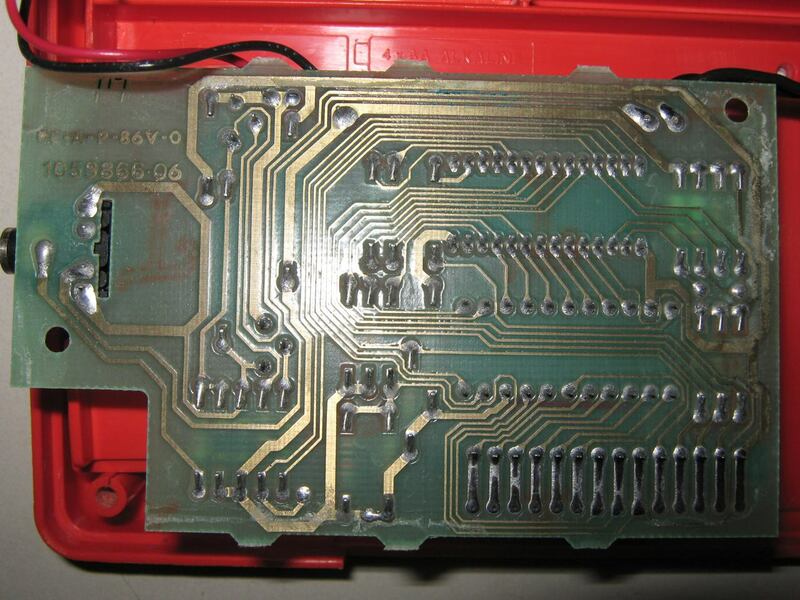 The general structure of the console was also altered similarly to the Super Speak & Spell such that the handle which had come at the top of the screen in prior Speak & Math units was now found on the bottom of the toy and ergonomic features were added to the shape. 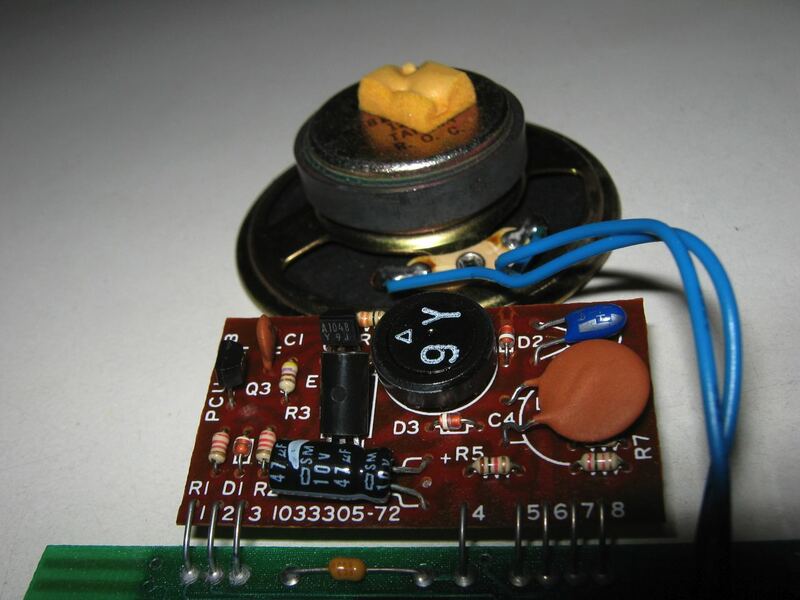 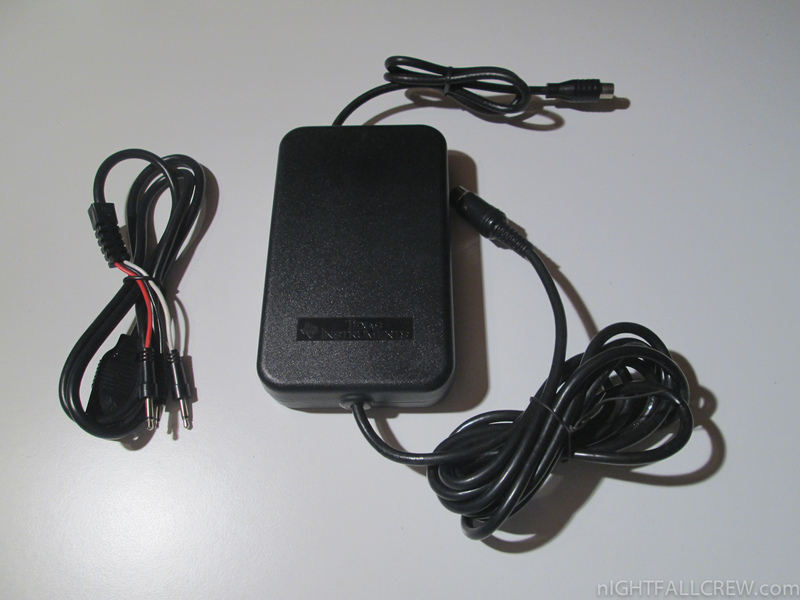 Powersupply 6 volt DC v1.2A with positive tip polarity. 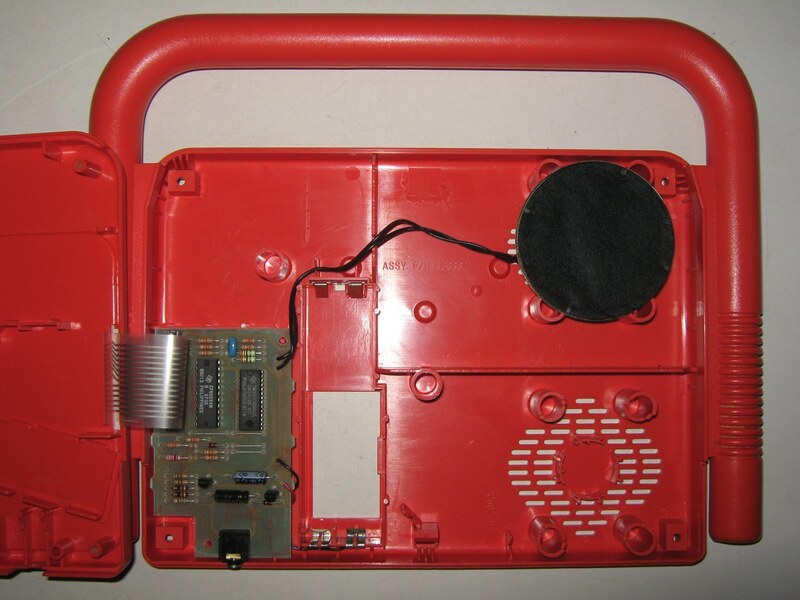 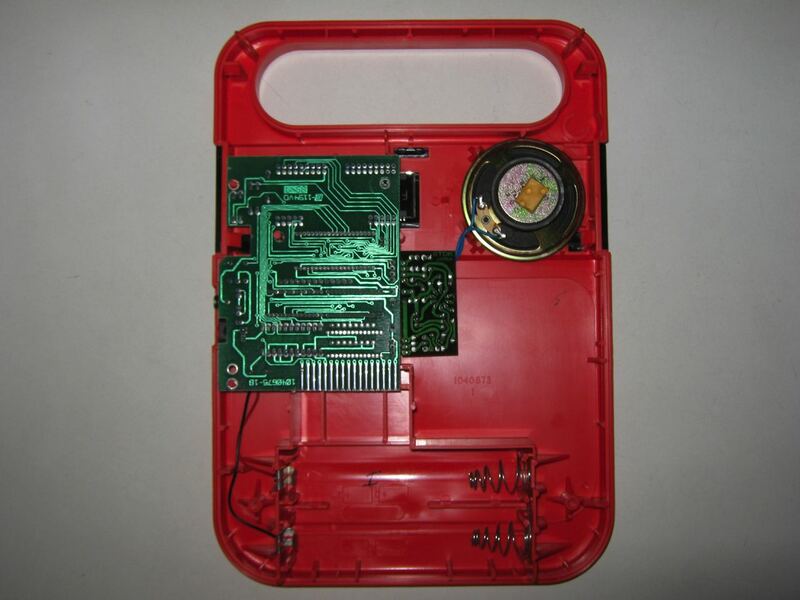 The Speak & Spell line is a series of electronic handheld educational toys created by Texas Instruments that consist of a speech synthesizer, a keyboard, and a receptor slot to receive one of a collection of ROM game library modules (collectively covered under US patent 3934233 ). The first Speak & Spell was introduced at the summer Consumer Electronics Show in June 1978, making it one of the earliest handheld electronic devices with a visual display to use interchangeable game cartridges. 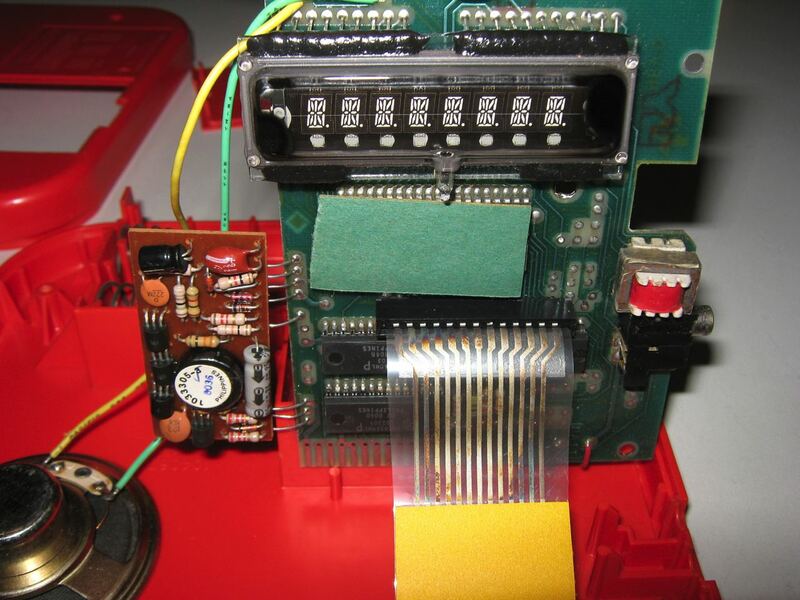 The Speak & Spell was created by a small team of engineers led by Paul Breedlove, himself an engineer, with Texas Instruments (TI) during the late 1970s. 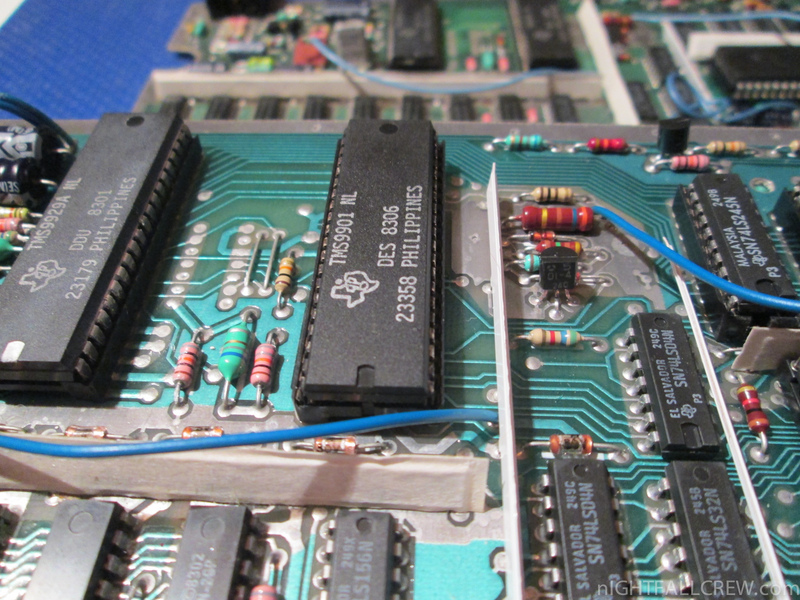 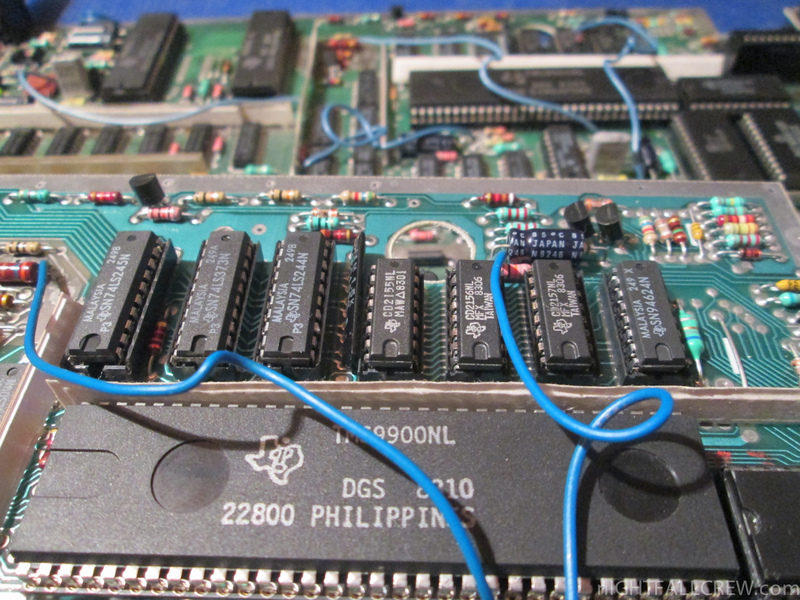 Development began in 1976 with an initial budget of $25,000, as an outgrowth of TI’s research into speech synthesis. 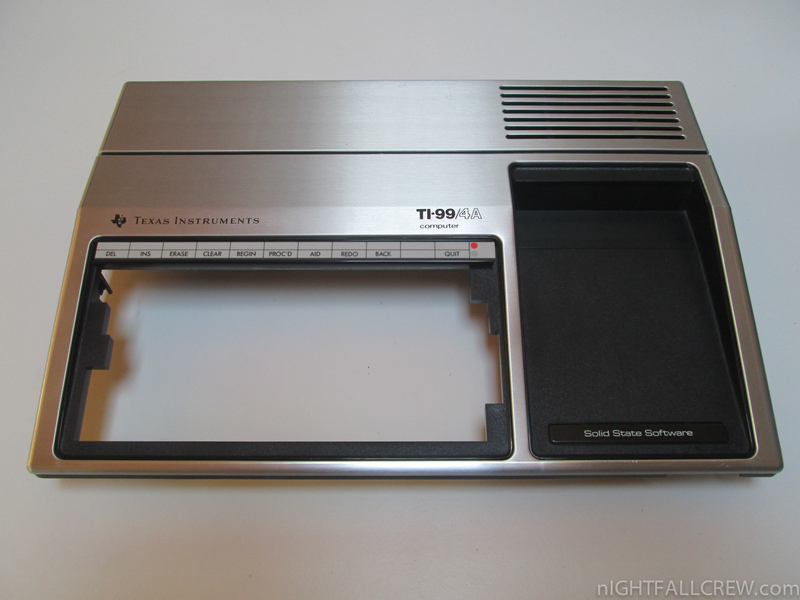 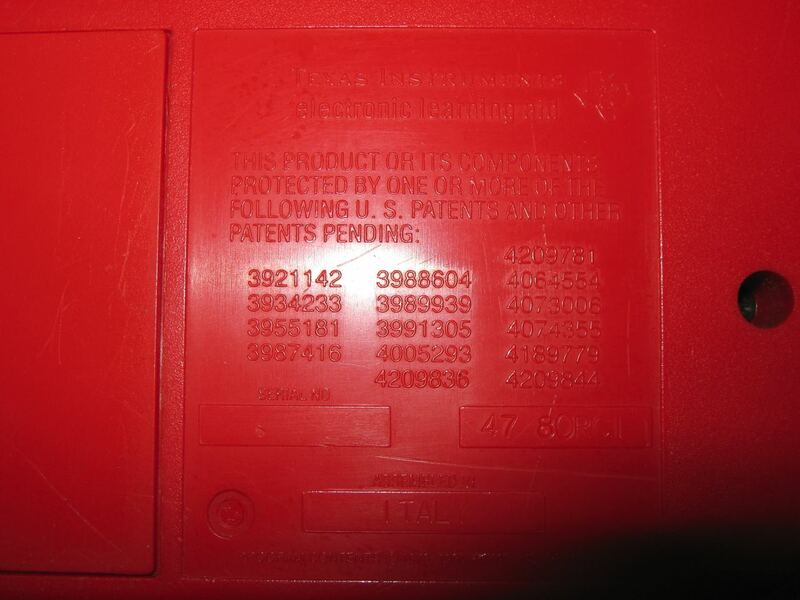 The completed proof version of the first console utilized TI’s trademarked Solid State Speech technology to store full words in a solid state format similar to the manner in which calculators of the time stored numbers. 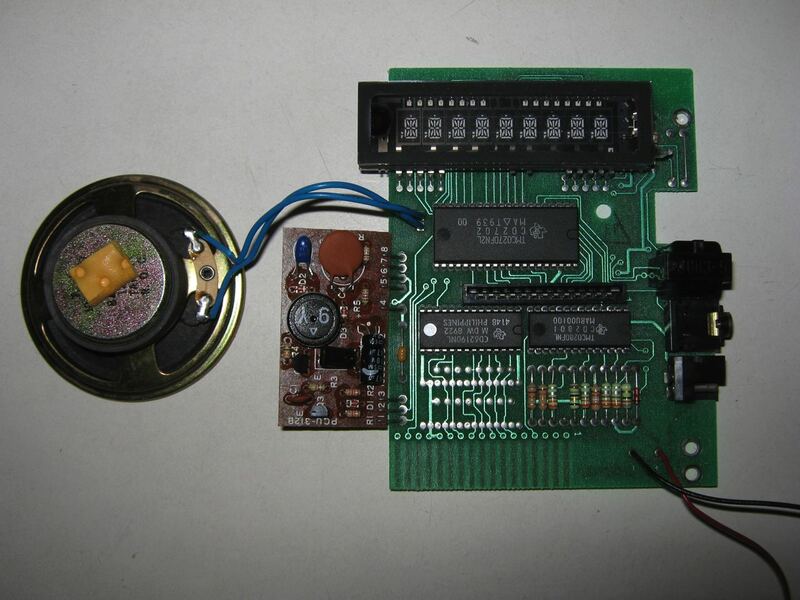 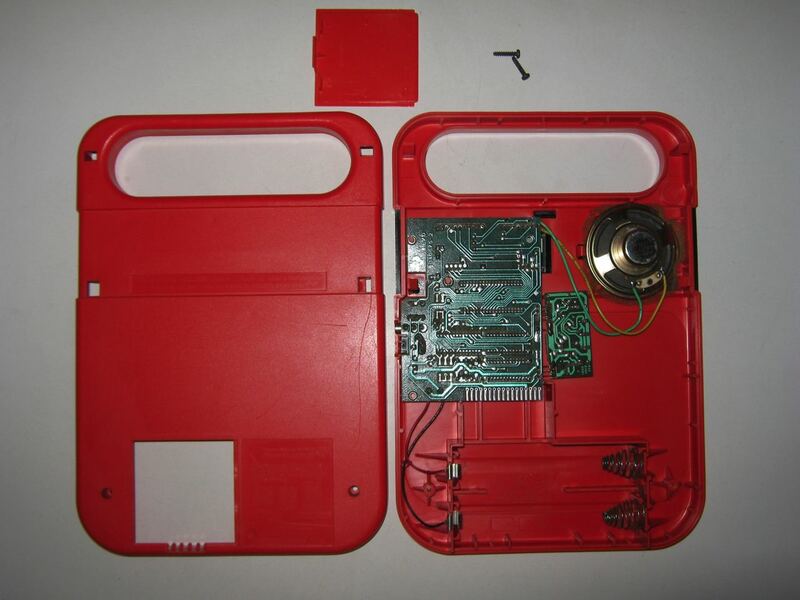 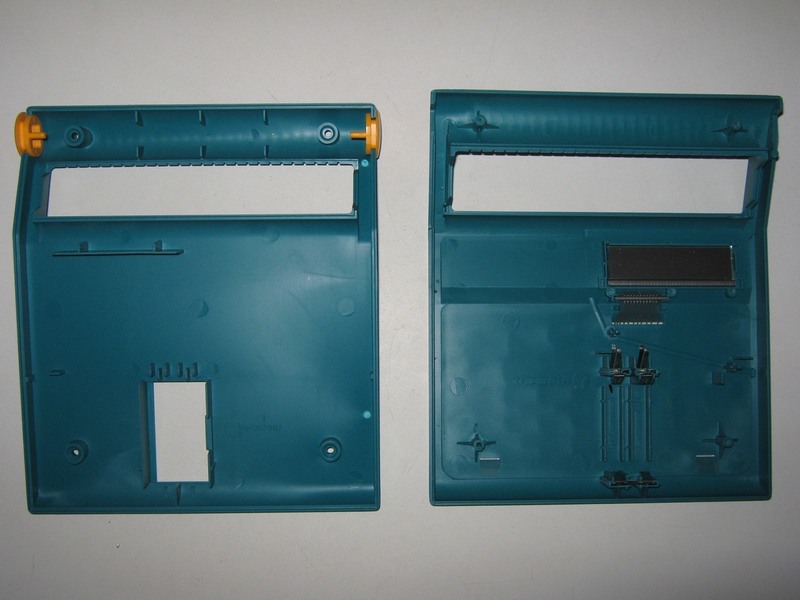 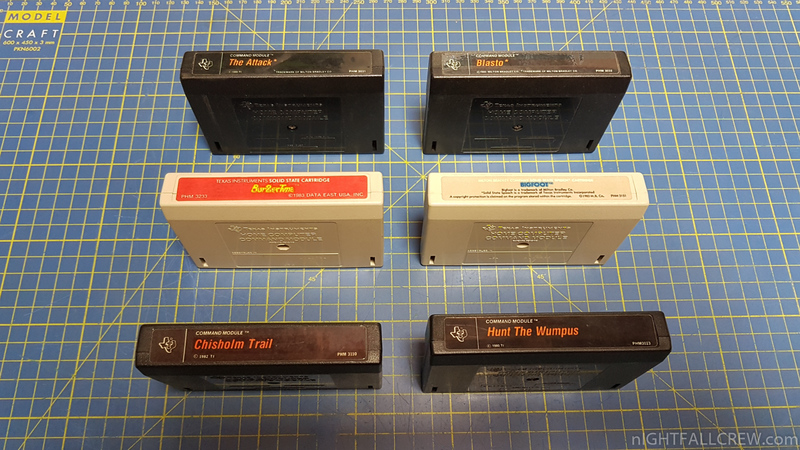 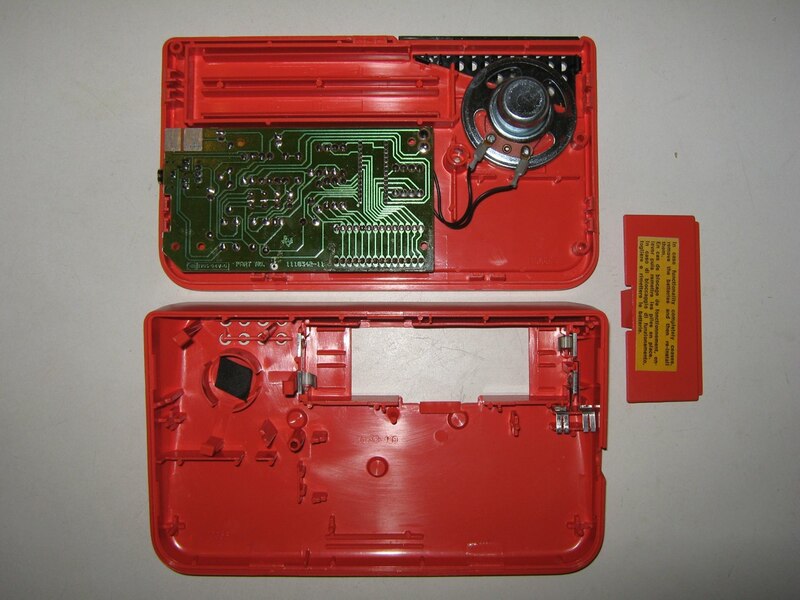 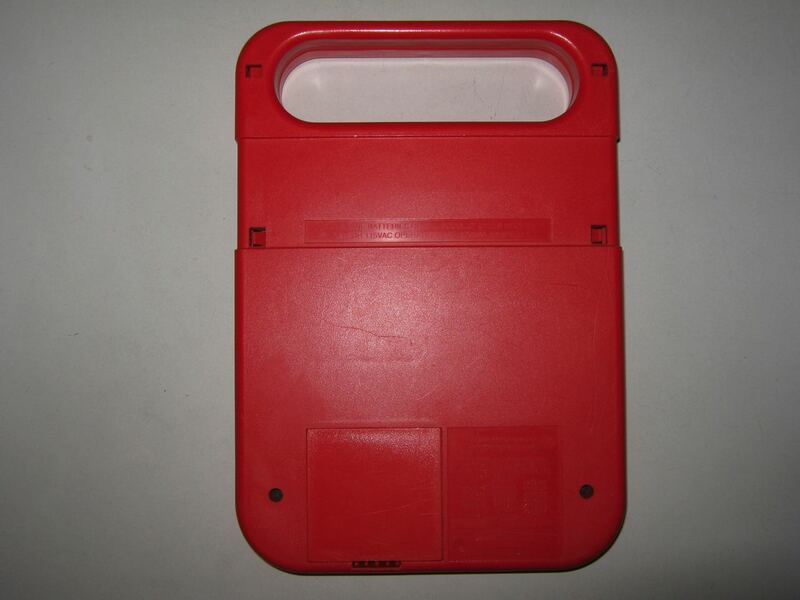 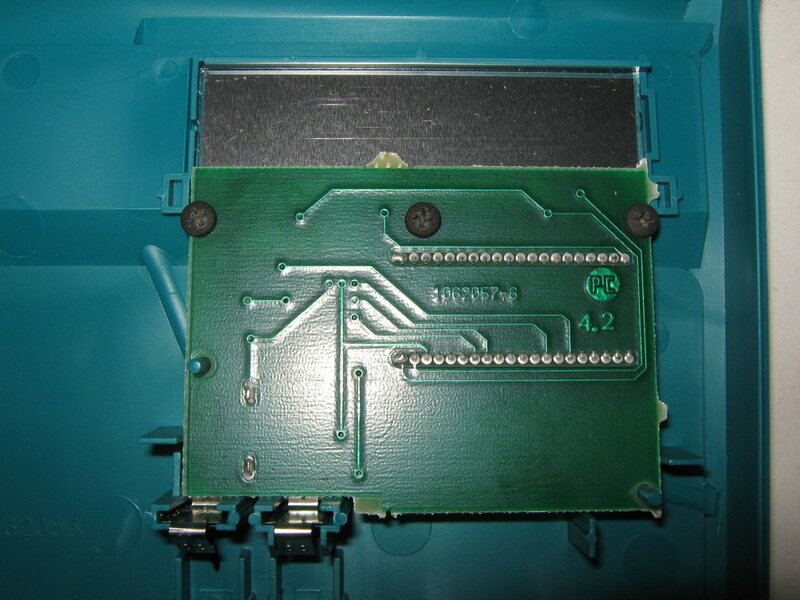 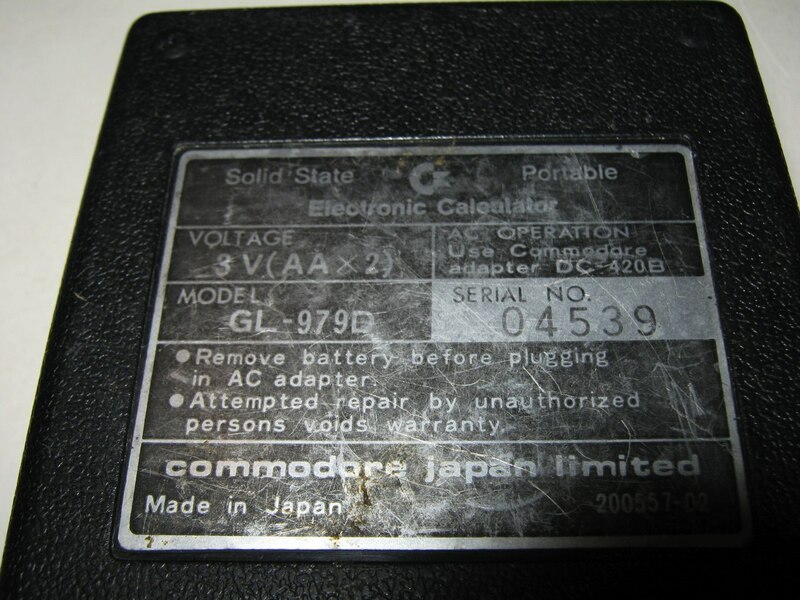 Additionally purchased cartridges (called expansion modules) could be inserted behind the battery receptacle to provide new solid state libraries and new games. 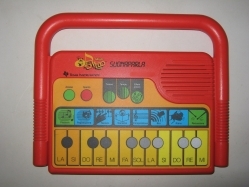 This represented the first time an educational toy utilized speech that was not recorded on tape or phonograph record (as with Mattel’s See ‘n Say line or the earlier Chatty Cathy dolls). 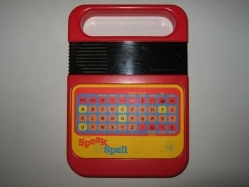 In 1983, the Speak & Spell was redesigned. 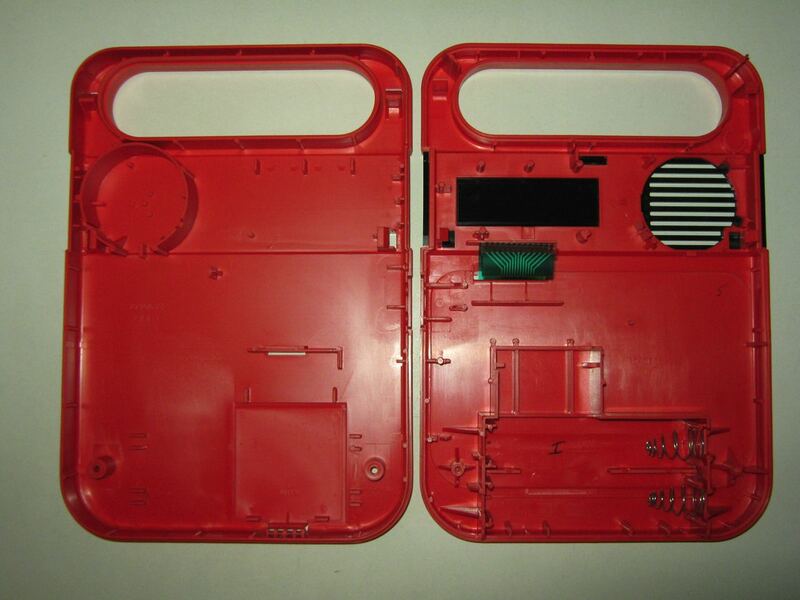 The change was even more minute, however, representing nothing more substantial than a redesign of the faceplate graphics. 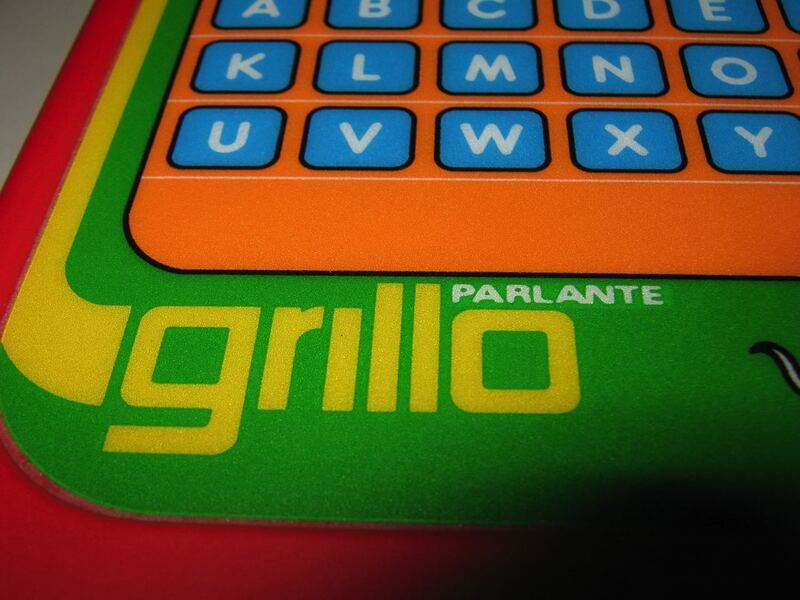 This version was marketed first in Italian as Grillo Parlante (lit. Speaking Cricket), and then later in the United States and England as the Speak & Spell, and in France as the Dictée Magique again.